I will refer to this from now on as “Yanping’s paper” just for simplicity, but Farquhar helped write it as well. The Star 48B is a very reliable (and available) upper stage, and stacking it on top of a Centaur is pretty unusual, but necessary for the high C3 (157.64 km^2/sec^2). That C3 is (as noted by Jonathan) hyperbolic with respect to the Sun! 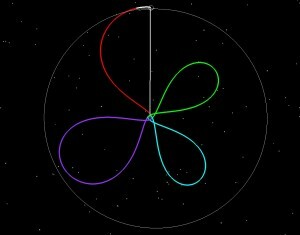 Our purpose here is to duplicate the interplanetary trajectory, so I’m not compelled to completely duplicate the launch segment. 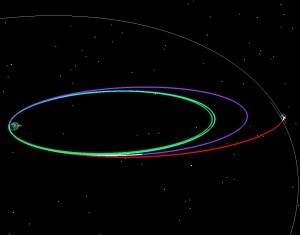 I’m going to model all burns as impulsive burns (I don’t have their engine models anyway) and I’m going to combine the Centaur and Star 48B into one insertion burn. 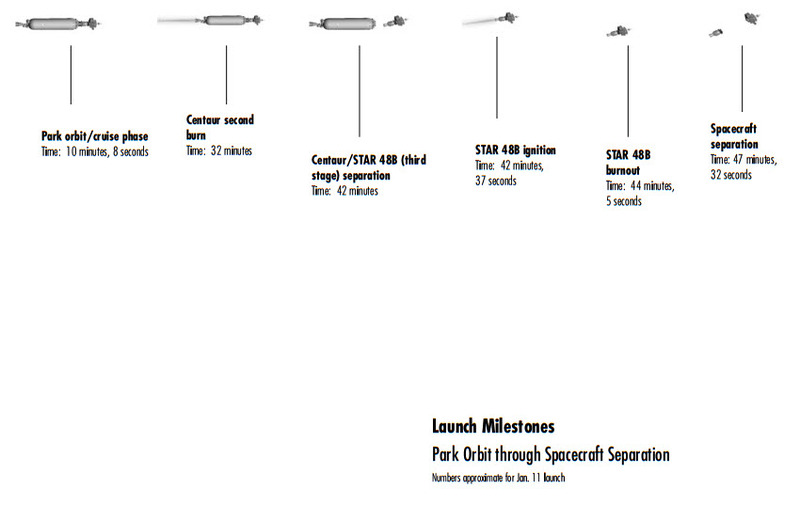 It’s fine to do this, since ultimately the multiple insertion burns are just targeting a single trajectory after launch, with a single defined asymptote. 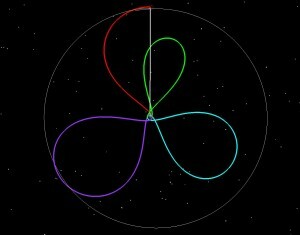 The Centaur and Star48 burns were optimized to hit a single asymptote, so I’ll just model that part. These conditions came originally from Trajopt (an old DOS program written at SAIC) and they’ll be good enough. I could have gotten them from a variety of other sources that help you search for planetary swingby opportunities. I’ve used MAnE, Trajopt and “Swingby Calculator”, and there are many others. Regardless, these conditions are plenty good and they ought to get me to the Jupiter swingby, and then I’ll work from there. 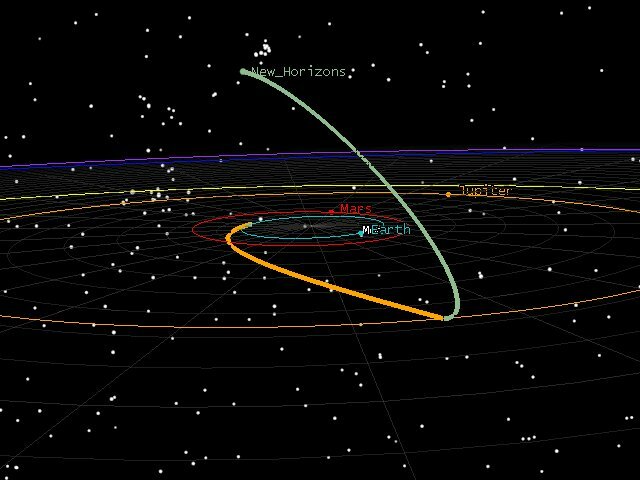 New Horizons Trajectory with Asymptote only. So that tells me that the asymptote isn’t going where I want. I can fix that pretty easily. 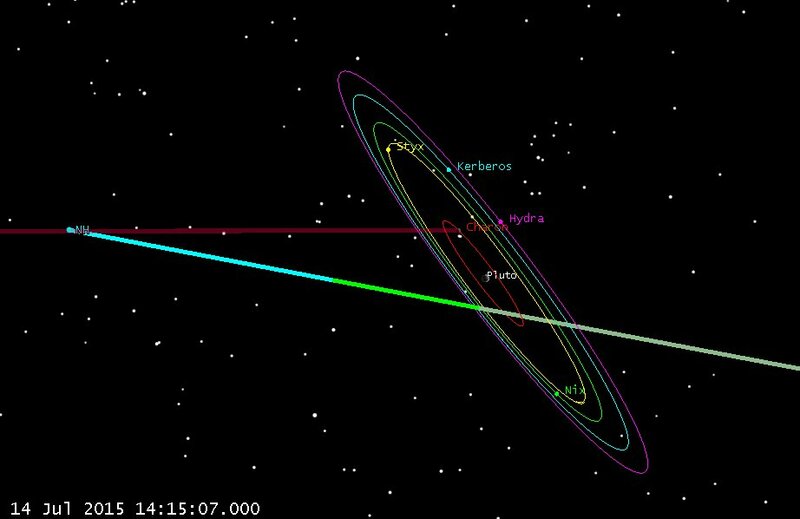 Yanping gives me the B-plane parameters I need at Jupiter to continue on the Pluto. If I match these parameters, I should then be close enough to an encounter with Pluto that Astrogator can target me the rest of the way in. I’ll match them by slightly varying my departure asymptote parameters. The B-plane is a fictional plane that is used for precise targeting during a gravity assist or for planetary orbit insertion. It can be best thought of as a bulls-eye or target plane attached to the assisting body. 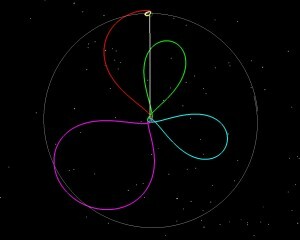 The trajectory’s intersection point on the B-plane is where the spacecraft would go if the swingby planet had no gravity. 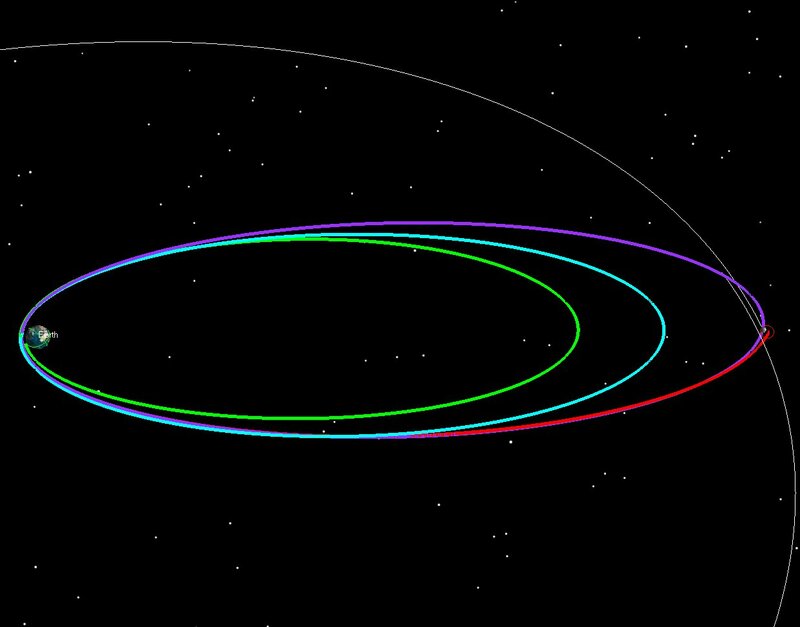 This turns out to be useful because B-plane targets behave very linearly as you move the trajectory around (while targeting) while the actual periapsis point (or closest approach point) doesn’t move very linearly near the planet due to the non-linear force of gravity. 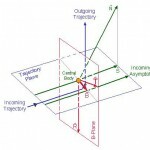 The vectors T and R lie in the B-Plane and are used as axes. The coordinates of our point in the coordinate system defined by those axes are called BdotT and BdotR, and they are the standard parameters given that allow you to target a swingby. 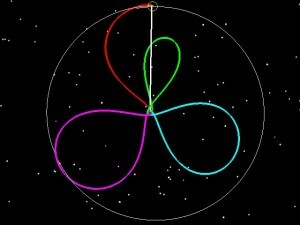 My initial state from Trajopt gives me the right direction for my transfer trajectory to get close to our B-plane targets (i.e. 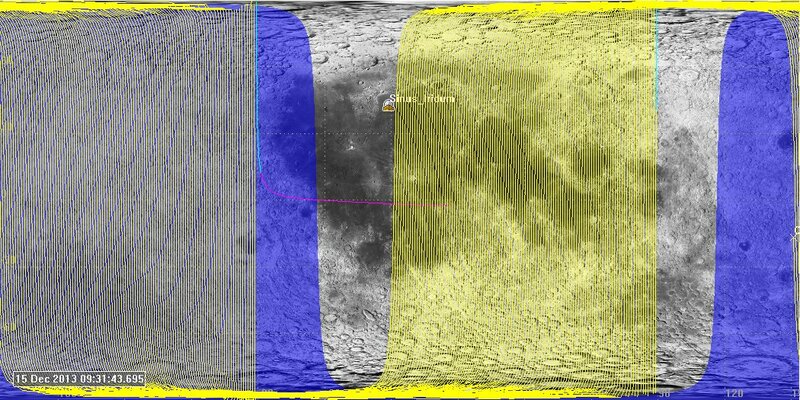 somewhere in the Jovian system), but I’m going to substitute in the B-plane parameters from Yanping’s paper instead of those that Trajopt originally generated. 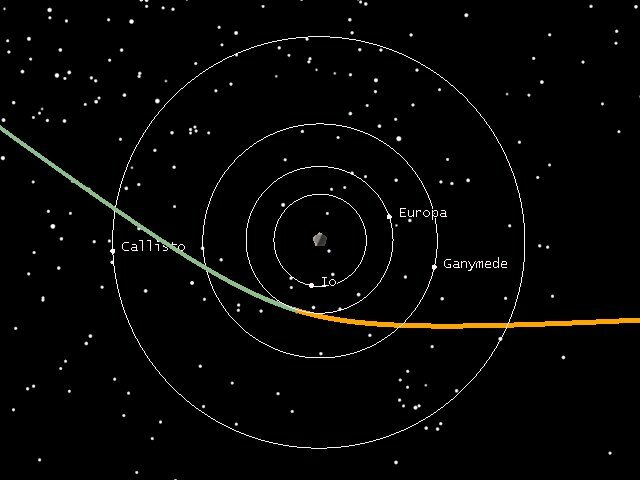 This should get me close enough to Pluto to hit our B-plane targets later. I’ll use these parameters for now, and then let them be varied later. On the real mission, Yanping used trajectory correction maneuvers (planned for up to 25! 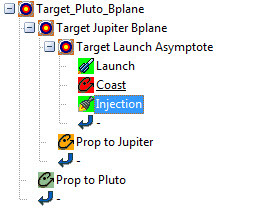 ), and didn’t try to accurately hit the Pluto B-plane precisely all the way back from launch. I can get away with that here, so I will. 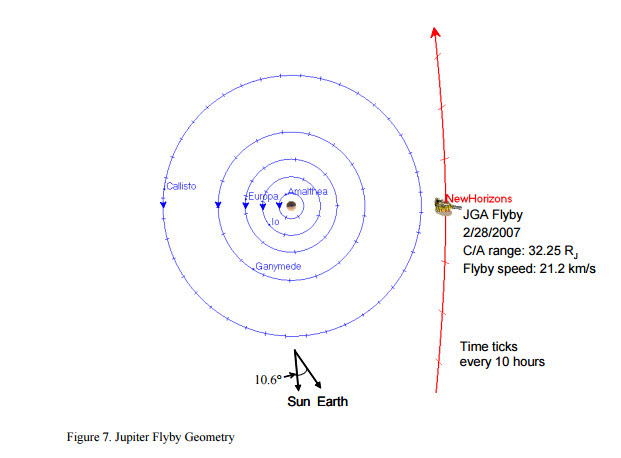 If I wanted to simulate how a real mission would do it, I’d truncate off my asymptote solution back at Earth, and our B-plane targets at Jupiter and recover from those errors with TCMs. In a numerical simulation, I can pretend that I can hit targets much more precisely than I can in real life, so I’m going to cheat here and do that. Which looks a lot more like the encounter geometry that Yanping showed in her paper. 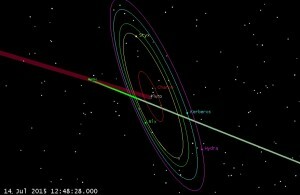 So now, I’d like to actually target my Pluto periapsis to the right spot and at the right time to match the encounter. 2. 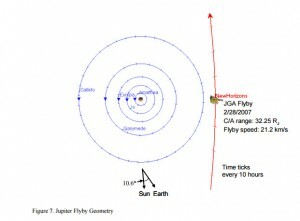 The second targeter (Target Jupiter Bplane) varies the outgoing asymptote conditions of the deepest targeter in order to hit B-plane parameters at the Jupiter swingby. 3. 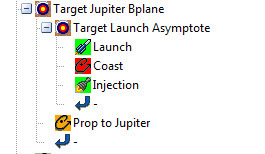 The outermost targeter (Target Pluto Bplane) varies the B-plane parameters at the Jupiter Swingby in order to hit the desired B-plane parameters at Pluto. This setup is simple but powerful and gets an answer, but I couldn’t really do this when flying a mission. 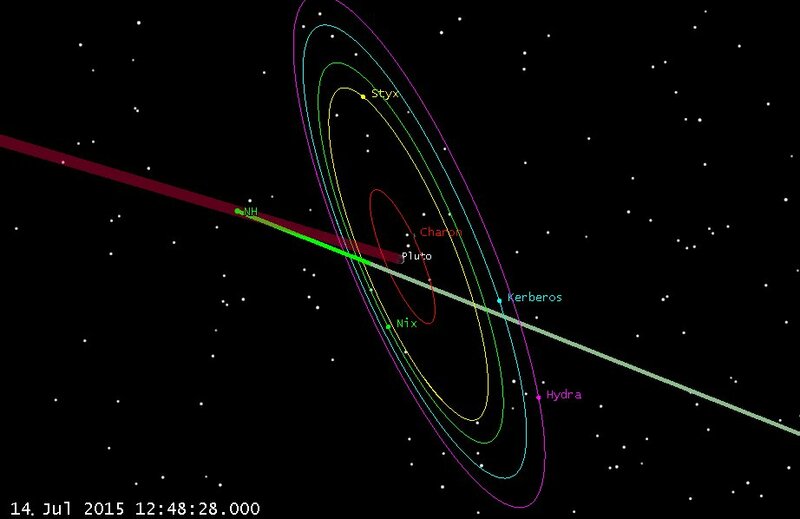 It essentially has me targeting the Pluto B-plane accurately from conditions all the way back at insertion in Earth orbit! 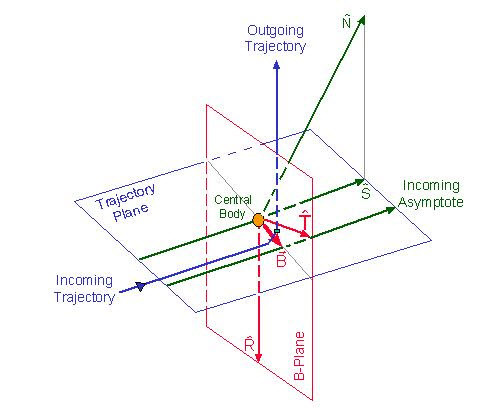 Launch vehicles can’t hit the asymptote RA and Dec within 0.000001 degrees, nor can injection maneuvers be executed with precision of 10e-6 meters. 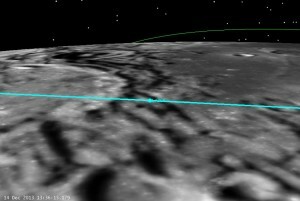 I’m going to ignore that though, since I know I’d have to do midcourses, and just enjoy the coolness of the trajectory. And they do (which is pretty satisfying!) 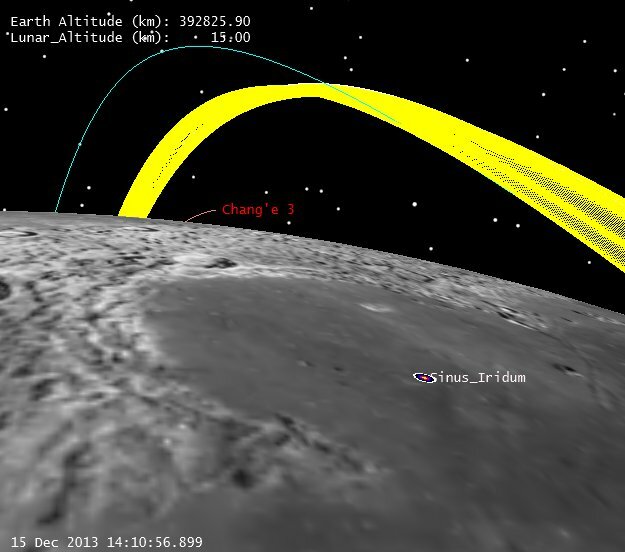 Of course our fellow Astrogator Yanping Guo had to do things much differently than this, since she had to correct out insertion errors, attitude dumps, and Orbit Determination (OD) errors, etc. all along the trajectory for 9.5 years! In fact while they had planned 25 Trajectory Correction Maneuvers (TCMs), they only had to perform 9, which saved them 2/3 of the planned delta-v. 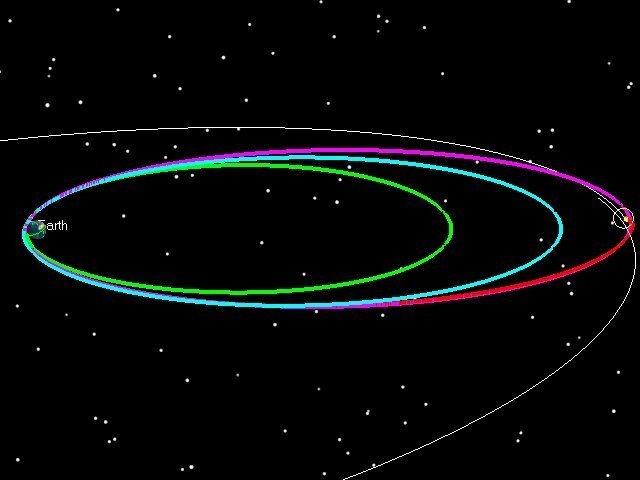 This gives them plenty of delta-v to use to retarget to a Kuiper belt object later this year (pending additional NASA funding). 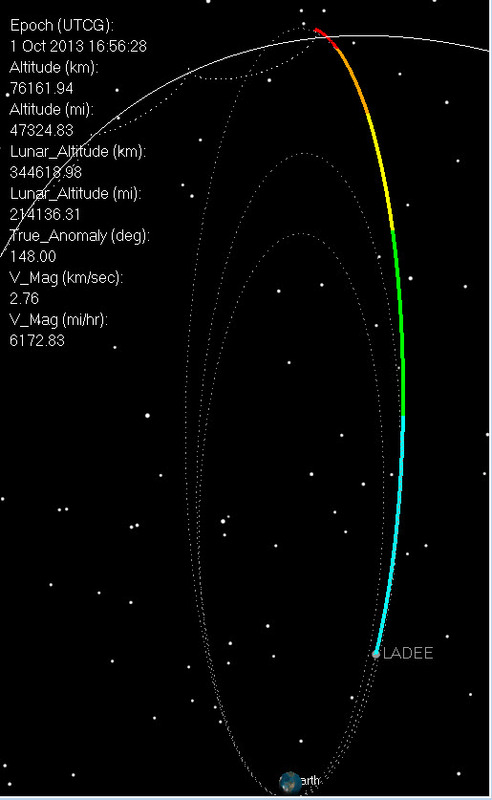 Once they announce the target KBO object, I’ll update and extend my trajectory to match. Also, I think the final conditions at the encounter may have been slightly off from what I have here (due to TCMs, adjustments, etc. that occurred after the paper was written). Once I get my hands on those conditions, I can trivially re-target things to achieve those states instead of what I hit above. (and I will, and will update here). What I’ve found so far has been conflicting, so I’ll stick with the paper. If someone has better data, pass it on. It’s easy to re-do. 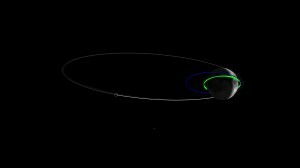 I end this fun with a bit of animation showing the Plutonian system in action. 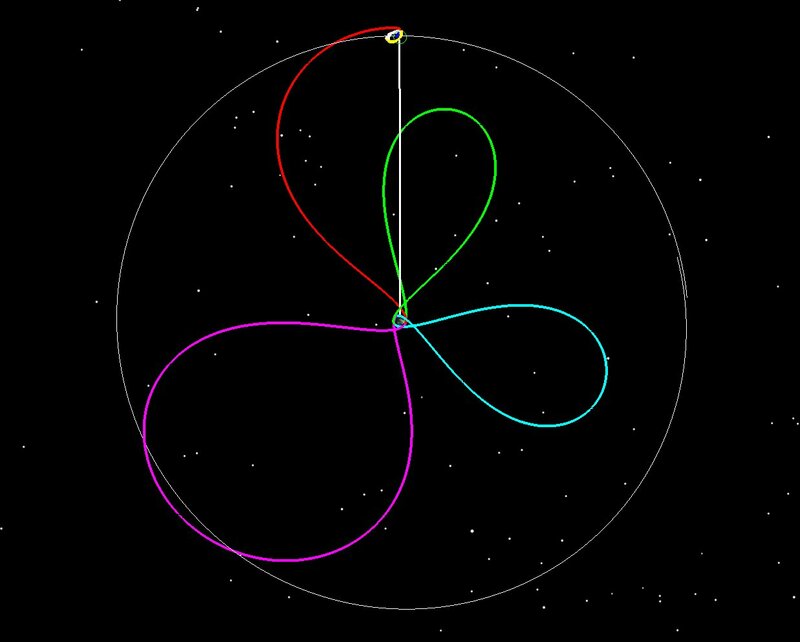 I’d been wanting to see an animation of the system with the dual-planets co-orbiting, so I just made one myself. 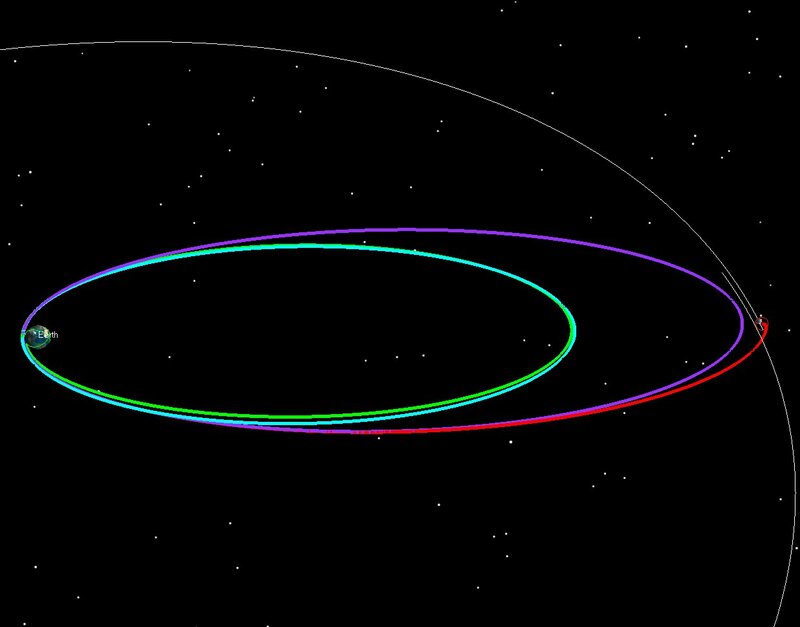 I love seeing Pluto dancing around the system barycenter. 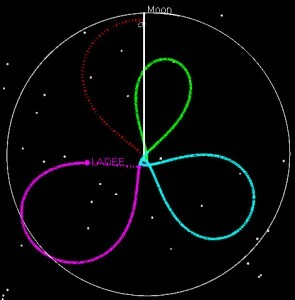 Planet and moon positions come from JPL SPICE files. Here’s a link to the STK scenario. 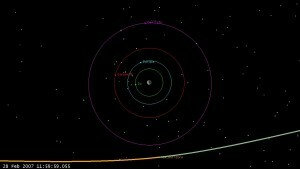 If you’d like an ephemeris in a non-STK format, email me and I’ll create one for you. 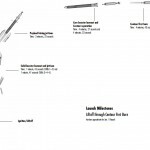 On CNN.com there was a story “Meteorite makes big crater in Nicaragua” by Amanda Barnett. 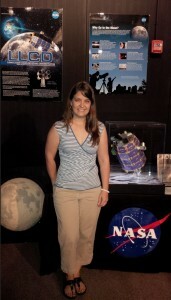 In the article, Amanda wrote: ‘AP quoted government spokeswoman Rosario Murillo as saying they’ve determined it was a “relatively small” meteorite that “appears to have come off an asteroid that was passing close to Earth.”‘ Well, that’s enough to get someone wondering if indeed it could have come off 2014 RC, which just did the flyby this past Sunday, 7 Sep 2014 at 18:15 UTC. 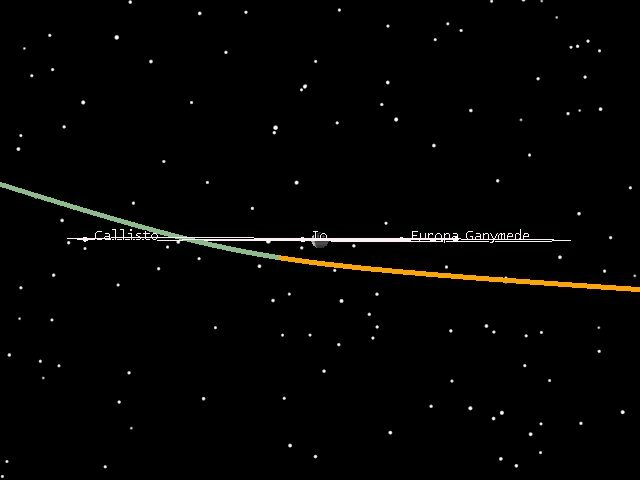 Well, Adam Gorski at Analytical Graphics made this easy by posting an STK scenario on AGI’s website blog: Asteroid 2014 RC flyby on Sunday. 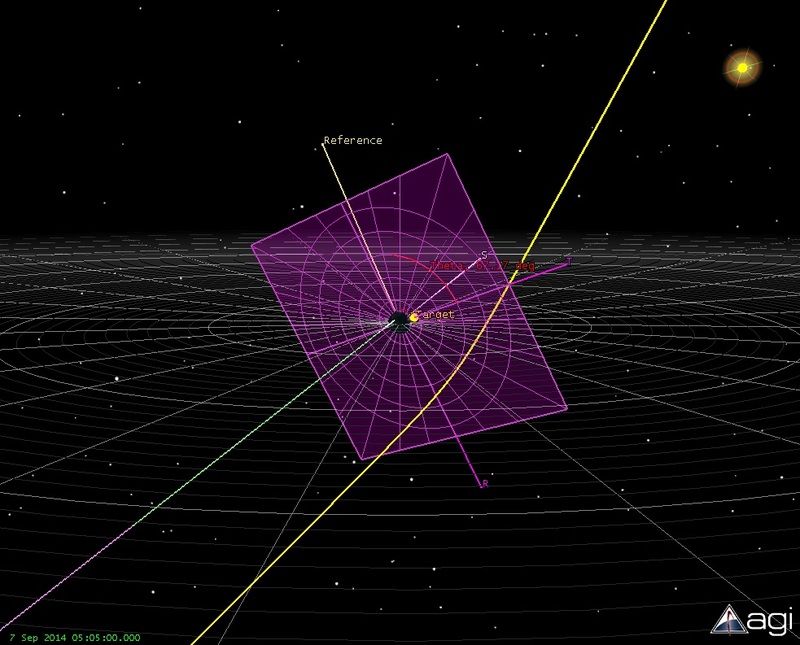 Adam got 2014 RC’s ephemeris from the JPL Horizons website, and set everything up. THANK YOU ADAM! In Amanda’s article, she says “The Nicaragua Dispatch said the hole is in the woods near Managua’s Sandino International Airport and about 1,000 feet (300 meters) from the Camino Real Hotel” which, according to Google Maps is at Latitude 12.148060, Longitude -86.184949. So, I put this into STK as a place object. 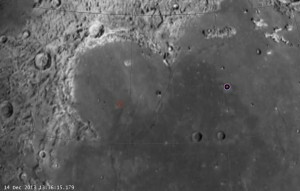 Amanda also mentions the time of impact, which is critical to this: “The Today Nicaragua site reported the crater was found after a loud blast about 11:05 p.m. on Saturday. ” Nicaragua is in the Central Time Zone, and from a few web searches seems that they do not use daylight savings time. So the time should be UTC – 6 hours. 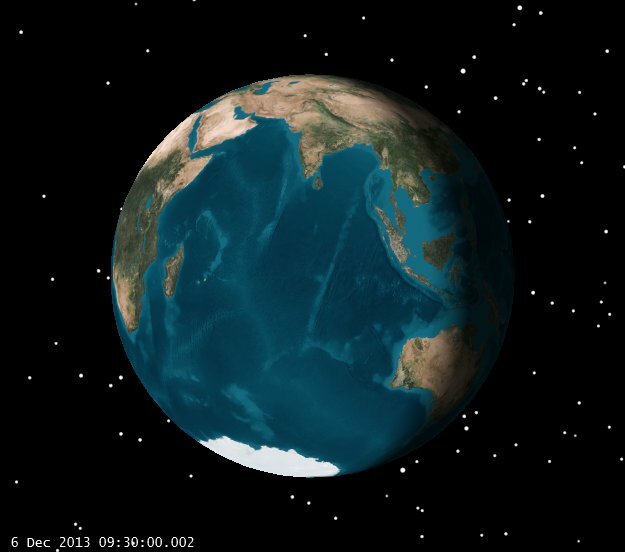 So, 11:05 pm on Saturday would be 7 Sep 2014 05:05 UTC. So, that seems pretty obvious. (Even if the time is off by an hour or so, it’s still on the correct side of Earth.) 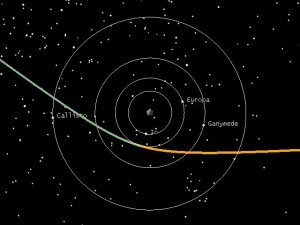 In this STK view, asteroid 2014 RC is traveling from left-to-right, and the hotel near which the crater was found is on the same side of the Earth. So far this myth is NOT busted; it’s plausible. So the direction seems reasonable, but we want to see if it’s reasonable that this meteorite could have come off of asteroid 2014 RC. 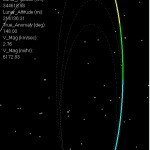 We can use a similar approach that several us did a few years ago investigating a potential space debris collision, as written in the paper “INVESTIGATING ORBITAL DEBRIS EVENTS USING NUMERICAL METHODS WITH FULL FORCE MODEL ORBIT PROPAGATION.” (by Timothy Carrico, John Carrico, Lisa Policastri, Mike Loucks, AAS 08-126.) We can see if a reasonable force applied in the past could have knocked a rock off of 2014 RC, or perhaps another impact caused a chunk to be thrown off. We can model this in STK/Astrogator by getting an initial state for 2014 RC in the past, and calculate what delta-V (change in velocity) would be needed to divert from 2014 RC’s trajectory to hit near the hotel at the observed time. Not knowing when the meteorite could have left its host, I chose to investigate the case if the rock left the asteroid 10 years ago. 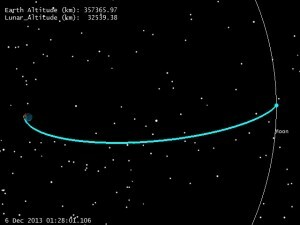 So, using our favorite “Follow Segment” in Astrogator, I propagated the initial state of the Asteroid that Adam had found backwards in time for ten years. 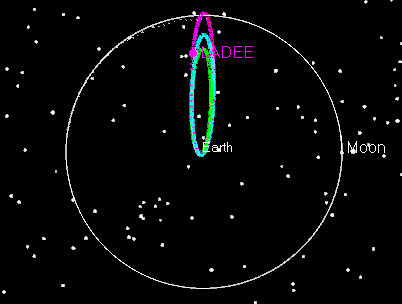 Then I modeled a small impulsive delta-V, and set up the Astrogator targeter to calculate the delta-V needed to hit the hotel at the specific time. 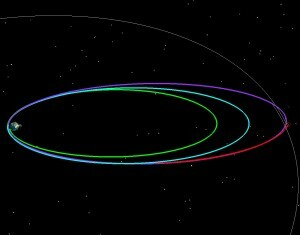 I set up the targeter to hit Earth B-Plane values of B dot T = 0.0, and B dot R = 0.0 (hitting the Earth right in the middle, as seen from the approaching asteroid). And when that profile converged, the next targeting profile targeted the exact latitude and longitude of the hotel. 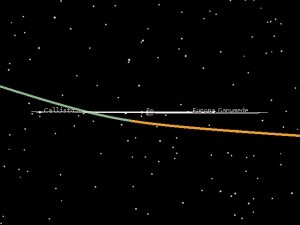 The B-Plane at the Earth as defined by the incoming meteorite trajectory. This converged pretty quickly, and gave a delta-V number of about 90 meters/second. Since an impact velocity of an asteroid could be 10 or more km/second, this low value seemed very reasonable. And, if the rock had come off a hundred, or several thousand years ago, it would take even less delta-V to hit near the hotel. So, once again, the myth is NOT busted, and it’s very plausible that this meteorite came off of asteroid 2014 RC as some point in the past. 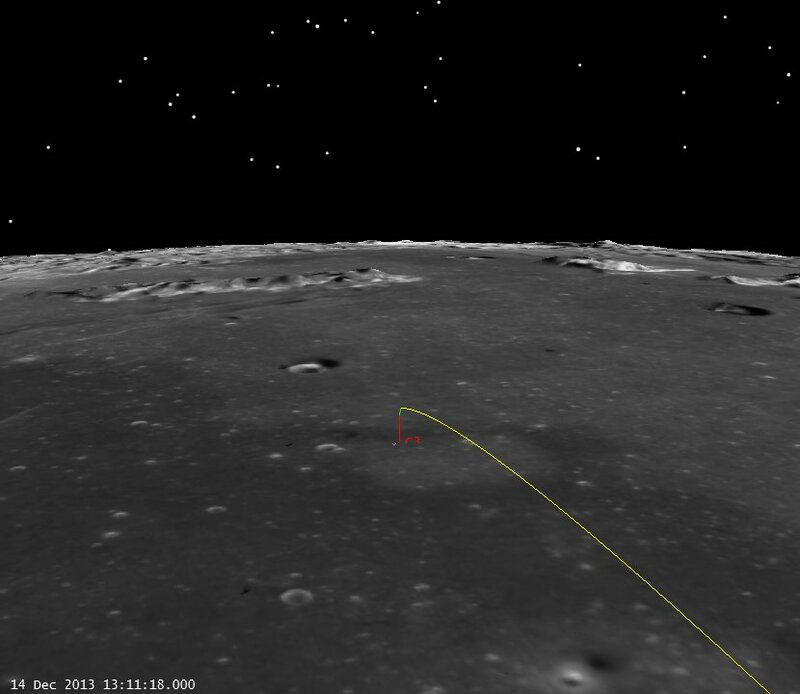 The Chang’e 3 Lander is on the surface! What an amazing accomplishment for our Chinese friends. 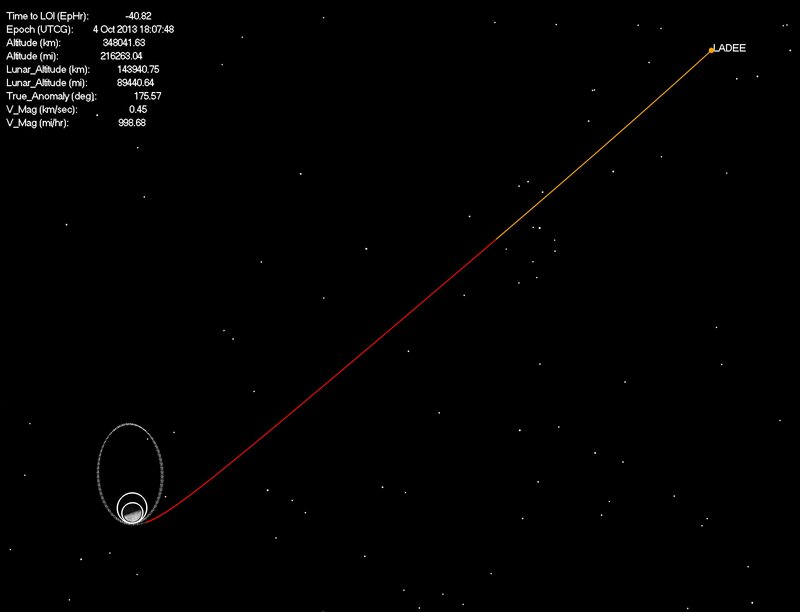 Now that it’s down, let’s take a look back at our guesses of the trajectory and see what we got wrong, and what we know about the real trajectory now that we know the landing site and the time of the landing. 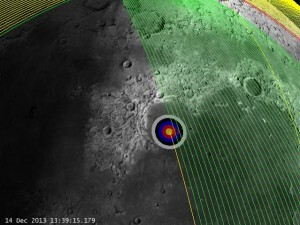 Real landing site/time Lat = 44.12 deg N. Lon = -19.51 W @ 13:11:18 UTC. 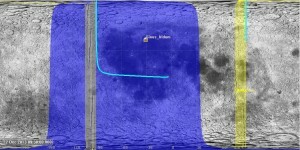 Real landing site with the bullseye to the east, prelaunch reported site to the west. Finally, here’s the local terrain looking from the southwest. 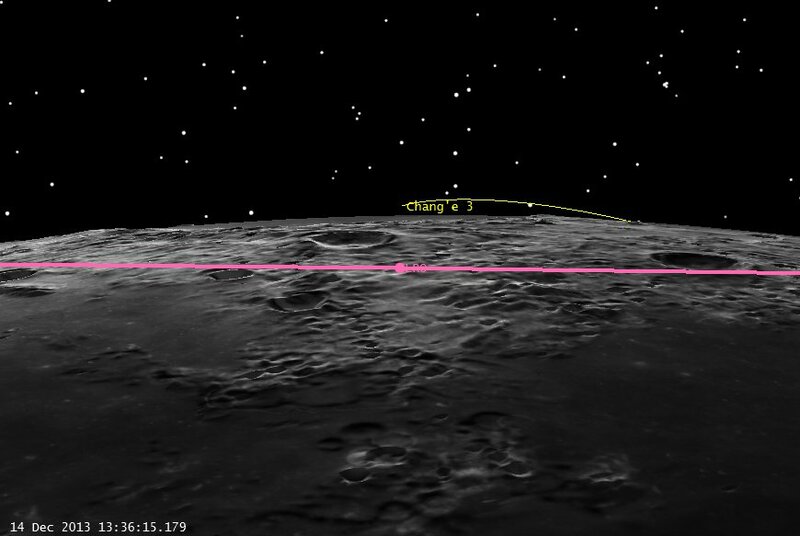 Again, really cool work by the Chinese Chang’e 3 Team! 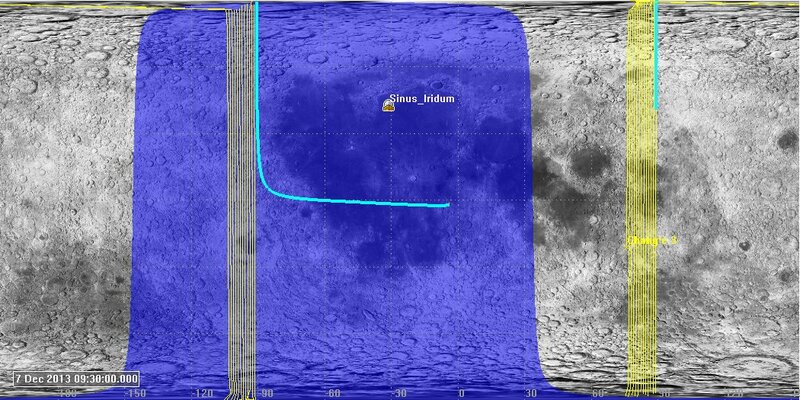 Our Chinese colleagues launched a lander to the Moon on December first, but unfortunately they have chosen not to publicly share where their spacecraft is. A few days ago there were several TLEs in Spacetrack associated with the Chang’e 3 launch, all of which didn’t appear to be associated with it at first glance (wrong plane, etc.) . 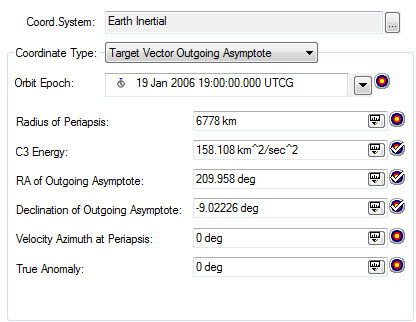 So, given we don’t have any real ephemeris available, let’s see if we can create a reasonable guess on our own with a bit of Astrodynamics detective work. First, let’s start off with some information we do know from their live broadcast. 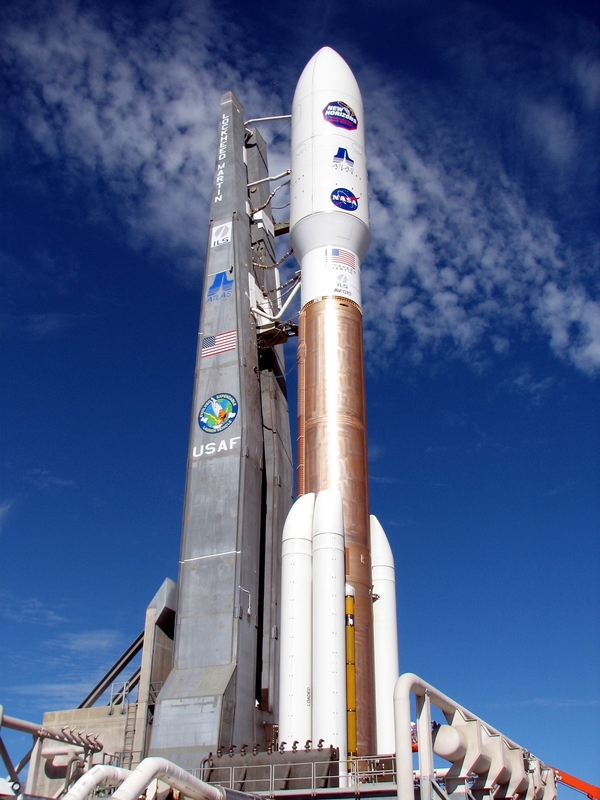 We know the launch time: 1 Dec 2013 17:30 UTC. 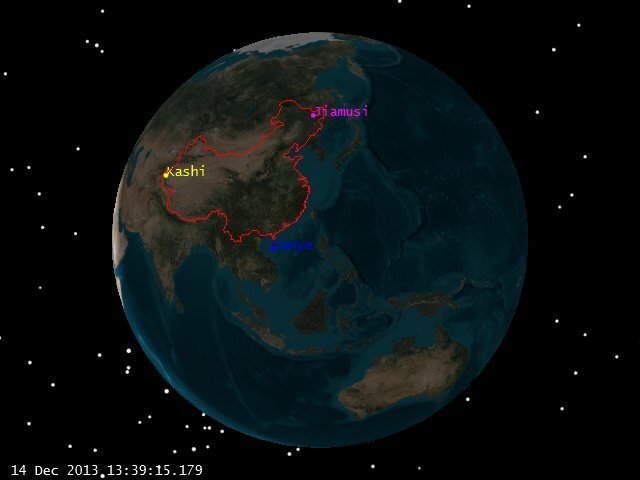 We know the launch site is the LC2 Launch Complex at the Xichang Satellite Launch Center (XSLC). 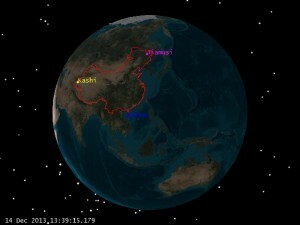 I have 28.2455 deg N Latitude, and 102.027 E Longitude for that site. Next question is, what direction do they launch, and to what altitude? Impulsive maneuvers. 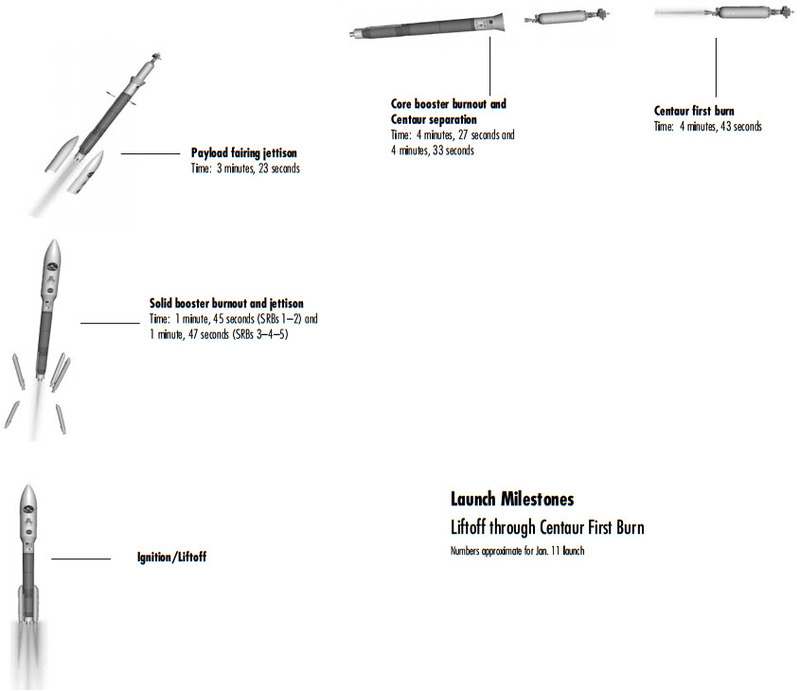 I’m going to use these for TLI and LOI for now, just because I’m lazy and don’t feel like digging out the parameters of the spacecraft (and it makes my setup a bit more complicated). 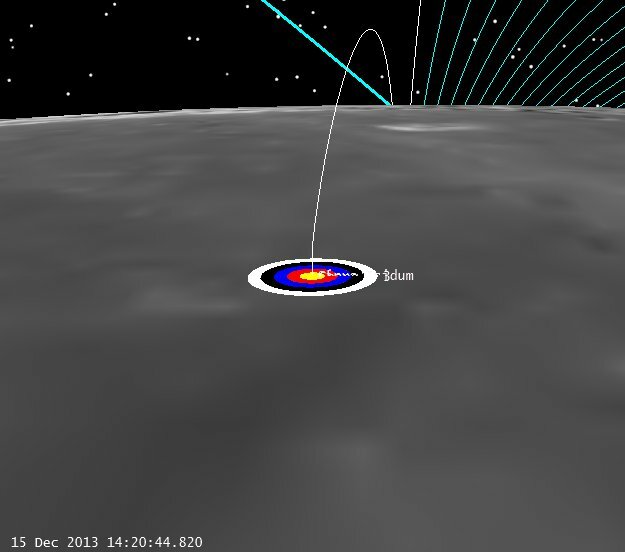 From Robert’s link about, I can eyeball the center of TLI at about 17:45:36 UTC on Dec 1, 2013. That’s where I’m going to put my TLI. I don’t know the exact launch azimuth they flew, so I’m going to guess 97.5 and then let it float a bit (i.e. use the burnout Lat, Lon and Alt as controls). I don’t know their exact burnout altitude, so I’m going to guess 210. Normally I’d know all of this stuff exactly. If I were planning the mission (as I did on LADEE) I knew my launch site, azimuth etc. and the exact burnout state of the Mintoaur V. I could figure out from this what my launch time ought to be, and when TLI was etc. In this case, I’m having to guess things from parameters I DO know. It’s detective work, but my peers in China have to work with the same physics and math as me, so it’s going to be pretty close. 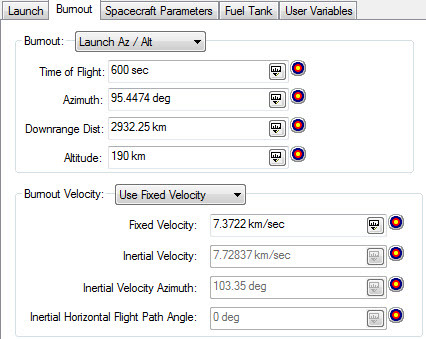 So I have to fix the launch time and the TLI time, let the burnout conditions float a bit for my controls, and then vary my TLI Delta-V to hit an LOI at the proper time and get into the proper orbit (I’m going to use a 100 km altitude, 90 deg inclination orbit). TLI occurs at the end of the yellow segment, burnout of stage 2 at the end of the red segment. 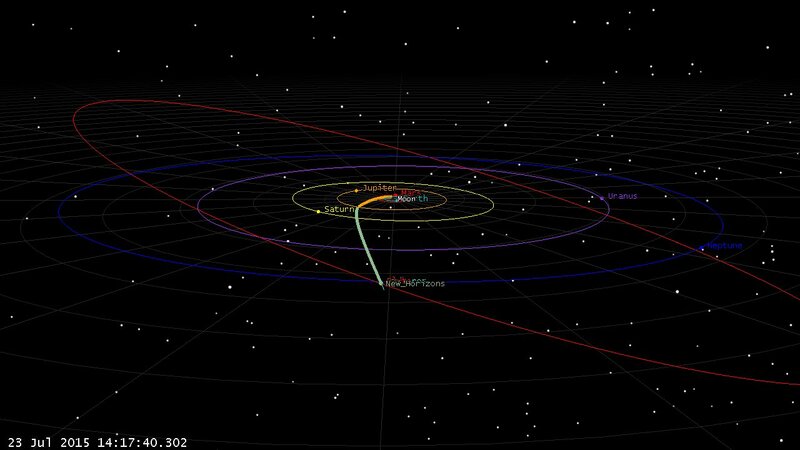 This gives us a good idea where C-3 is now, but what does the rest of the trajectory look like? 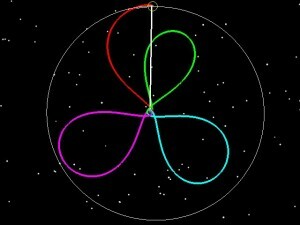 First let’s look at the LOI geometry. Note that with a 5 day transfer(4.8 really, 116 hrs) the approach to the Moon comes from the side, with respect to the Earth. 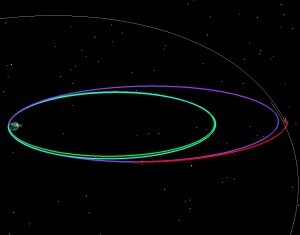 This is a nice geometry for visibility at LOI, especially for a polar orbit, because it lets the LOI burn happen in full view of the ground. 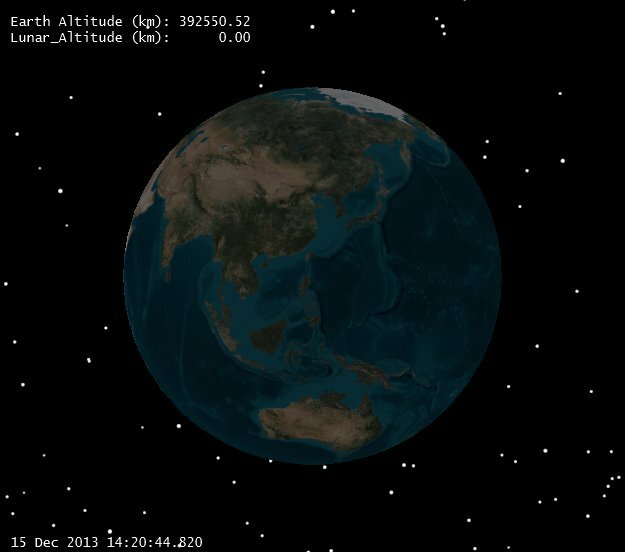 With equatorial spacecraft (LADEE) getting the LOI in view of the Earth can require a bit more work. 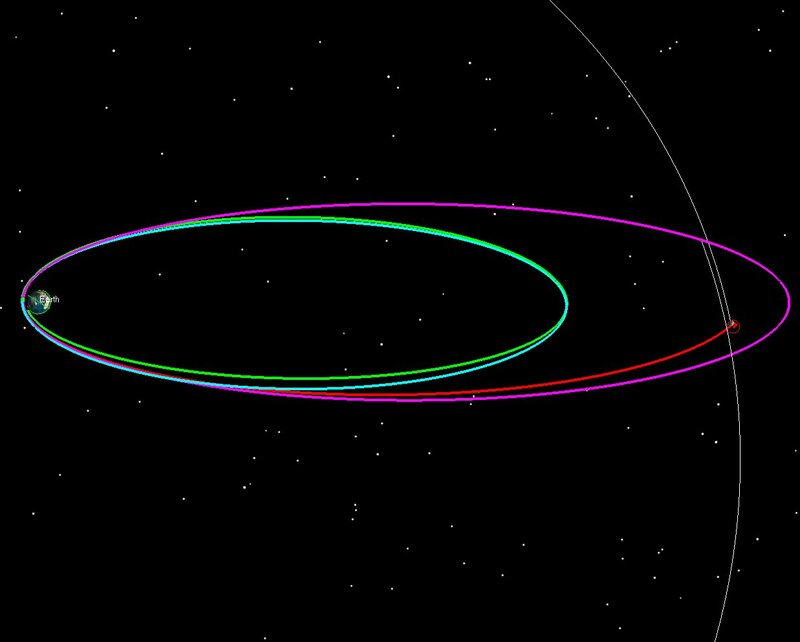 It’s not a great geometry for watching the maneuver, given that there won’t be much radial-rate component, but it’ll do. Now let’s take a closer look at the Earth to see what is visible. Without digging up the locations of the ground stations, it’s pretty clear that major portions of China are visible, as is Australia. 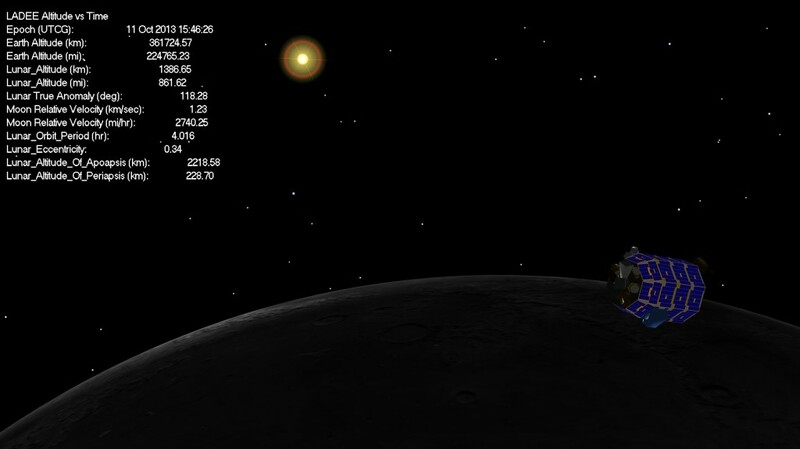 Since we know Chang’e 3 is using some ESA stations, this is set up for a multiple ground stations to see LOI. 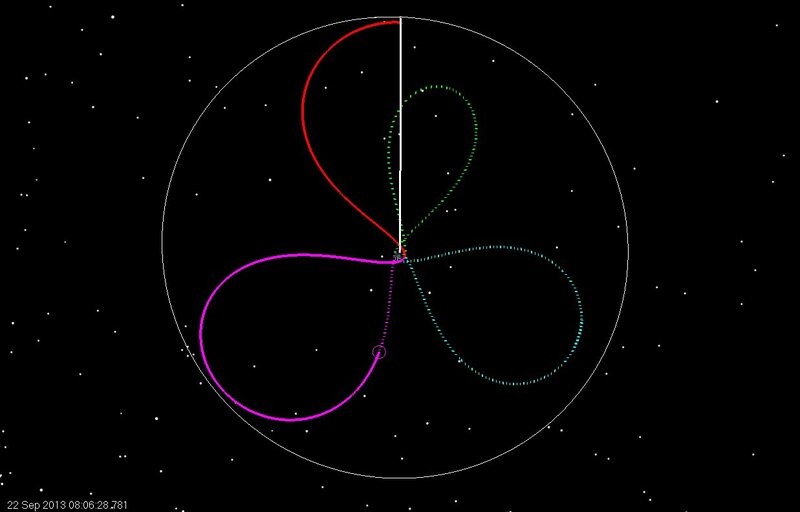 Nice geometry for Orbit determination and real-time tracking of the event. 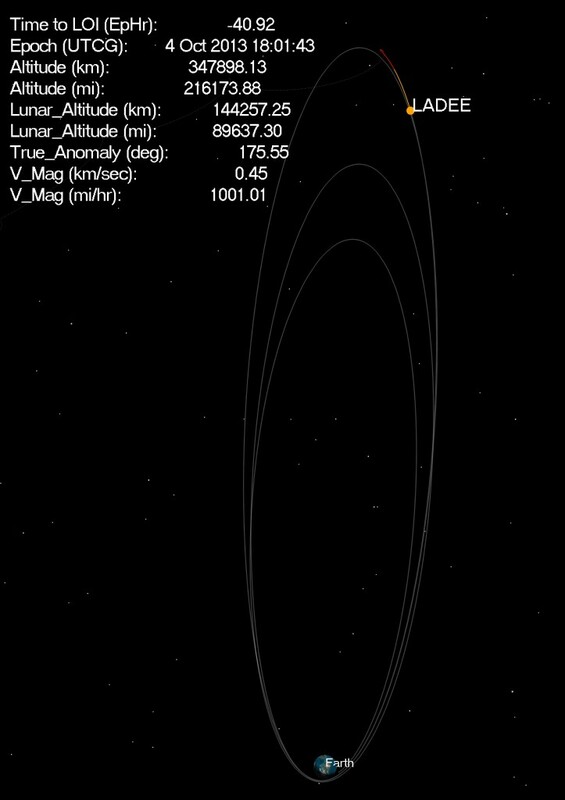 It’s hard to show on this scale, but if you zoom and look closely at the left, you can see the orbit starts at 100 km (yellow) and then descends to 15 km on the right. 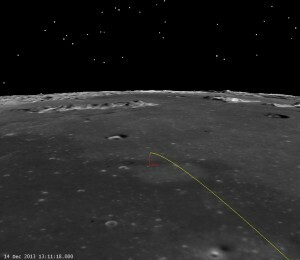 Let’s look from the landing site perspective. 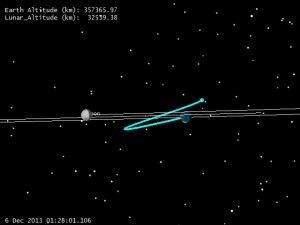 Note we can see the approach hyperbola still (blue) the 100 km parking orbit (yellow) and the spacecraft at Periapsis just peeking over the limb at the top. You can see that the parking orbit isn’t completely locked inertially, it’s got a bit of drift in it from the Lunar gravity field. Pretty fun stuff. We welcome any updates, if anyone has better data than we do, it’s real easy to change the assumptions and re-run. 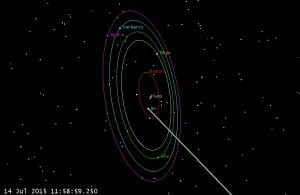 Part of an astrogator’s job is to determine the spacecraft’s current orbit, and predict where it will be in the future, just as the navigators on sailing ships figured out where their ship was and where they were going. 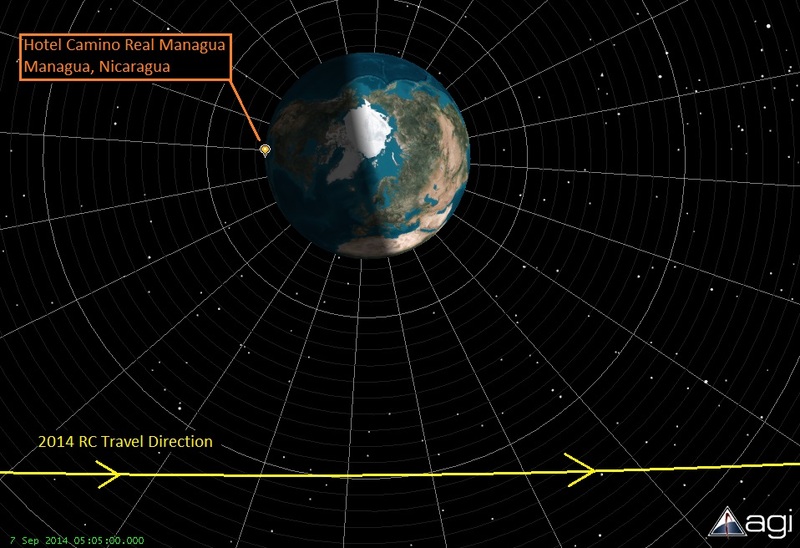 Those navigators used star sightings, Sun observations, and accurate clocks to figure out their latitude and longitude. One of the ways they calculated their speed was to drop floats into the water and time how long it took for the ship to move a measured distance. On LADEE we also take observations and measurements to figure out where LADEE is. These measurements are called tracking data, which we receive from many ground tracking stations which are positioned around the world. We use large dish antennae from NASA’s Near Earth Network, NASA’s Deep Space Network, and from the commercial Universal Space Network. 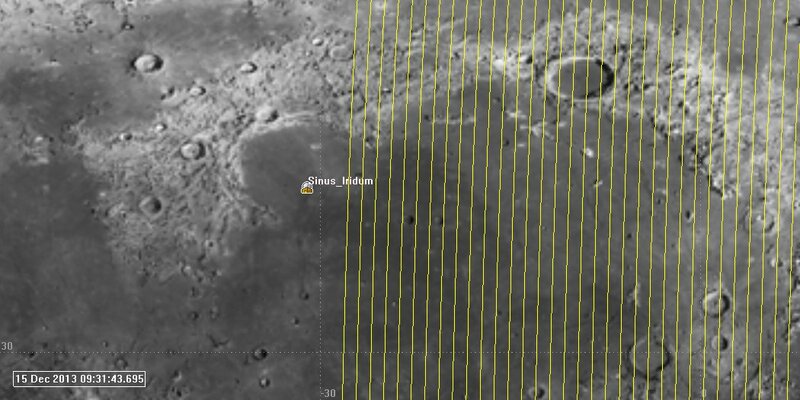 We schedule time each day for the various ground stations to track LADEE, using radio signals, and they send us tracking data files containing their measurements during and after the pass. 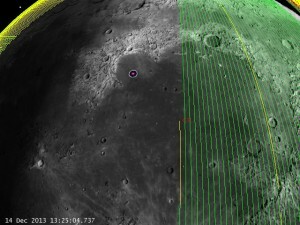 In these files we can get the ground station’s observations of the distance to the spacecraft (“Range”); the speed at which the spacecraft is moving towards or away from the ground station (“Doppler” or “Range Rate”); and the angles in the sky where LADEE is, from the ground stations’ point-of-view. We don’t always get all these types of measurements, nor do we get tracking data all the time, but we don’t always need to. 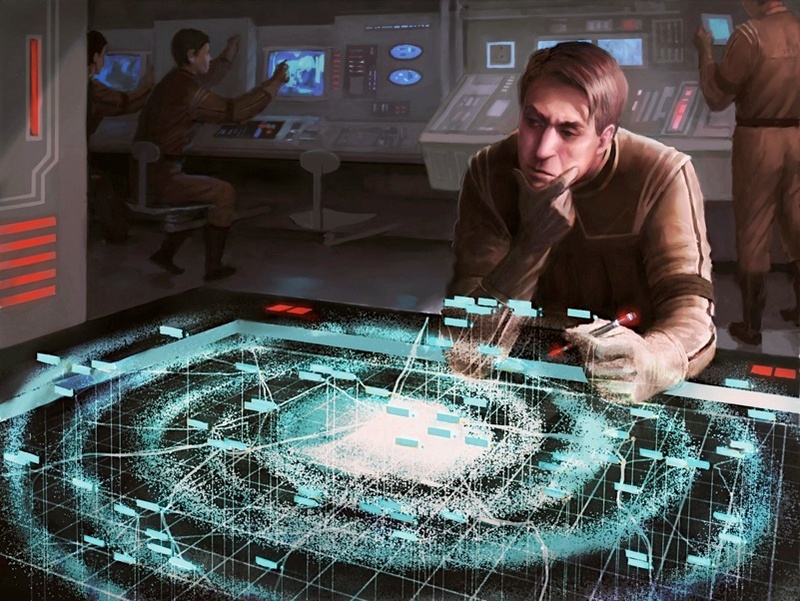 (We will never say no to more tracking data, though. We like it when the controllers schedule extra time to communicate with the spacecraft because then we get more tracking data! 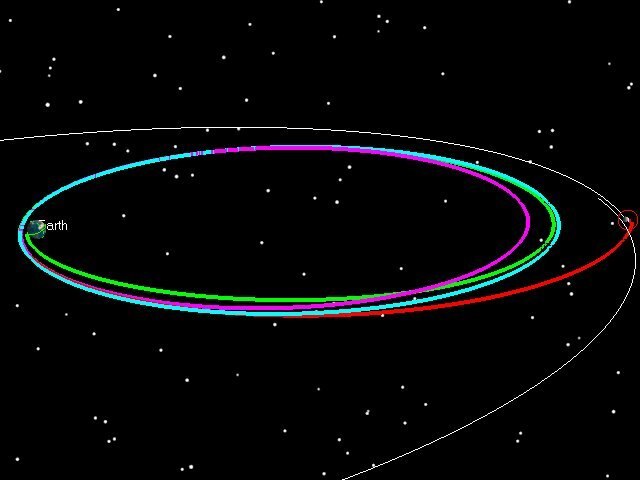 We often exclaim, “More Data!”) After we get the tracking data, we use a first guess at what we think the orbit is currently, and we estimate a new orbit by adjusting the trajectory slightly to fit the new measurements. 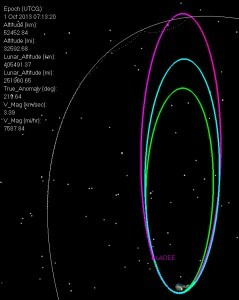 We use AGI’s Optimal Extended Kalman Filter, (in Orbit Determination Tool Kit, aka “ODTK”) to read these files and estimate LADEE’s orbit. 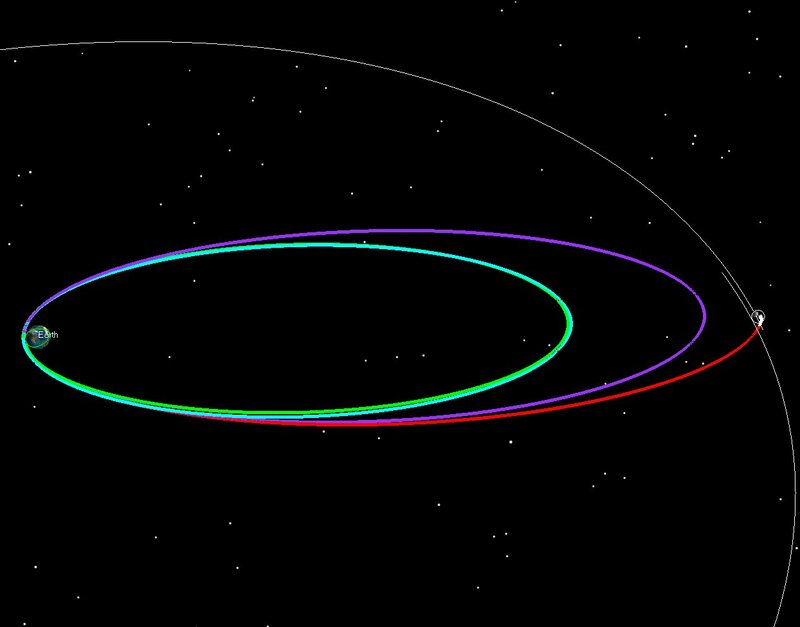 We’ve used this on many other cislunar and Earth orbits before, and it really works great! 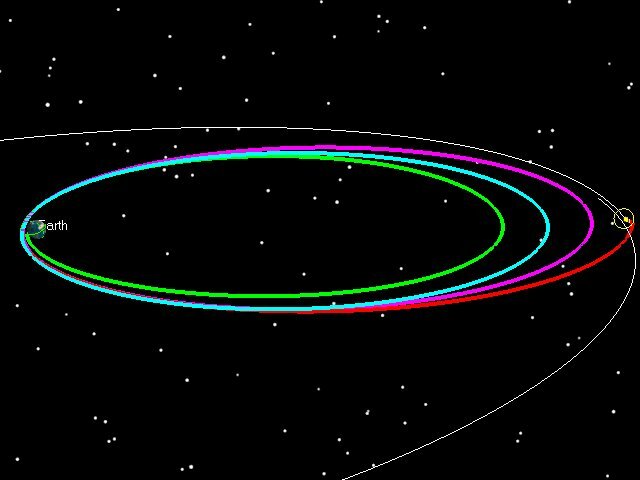 The end result of our orbit determination work is a spacecraft ephemeris file of where LADEE has been in the past, and another ephemeris file of the predicted orbit, which is where we think LADEE will be in the future. 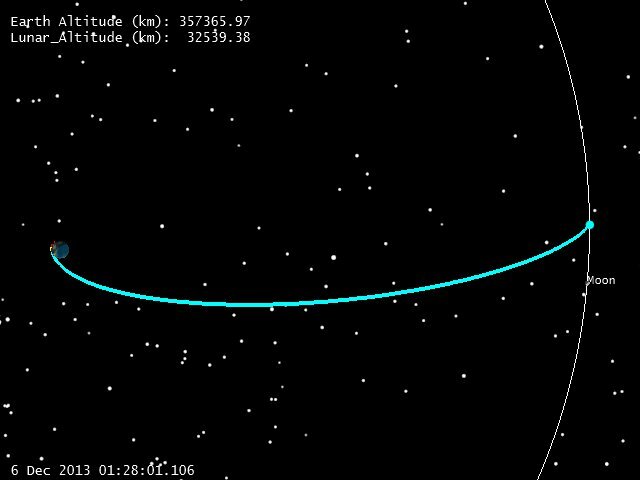 The ephemeris file of the past trajectory is sent to the scientists who need to know where LADEE was when it took their science measurements. 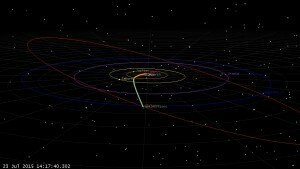 The predicted ephemeris file is used by the mission planners for scheduling their activities. 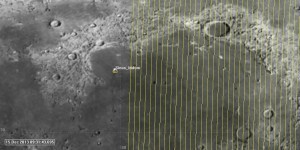 It’s also used by other astrogators to calculate “acquisition” data to send to the ground stations so they know where and when to point their antenna to track LADEE. 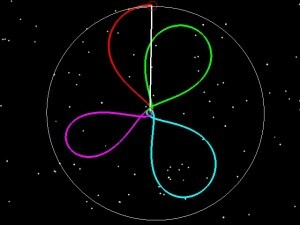 And it’s used by other astrogators to plan the next orbit maneuvers and attitude orientation plans. 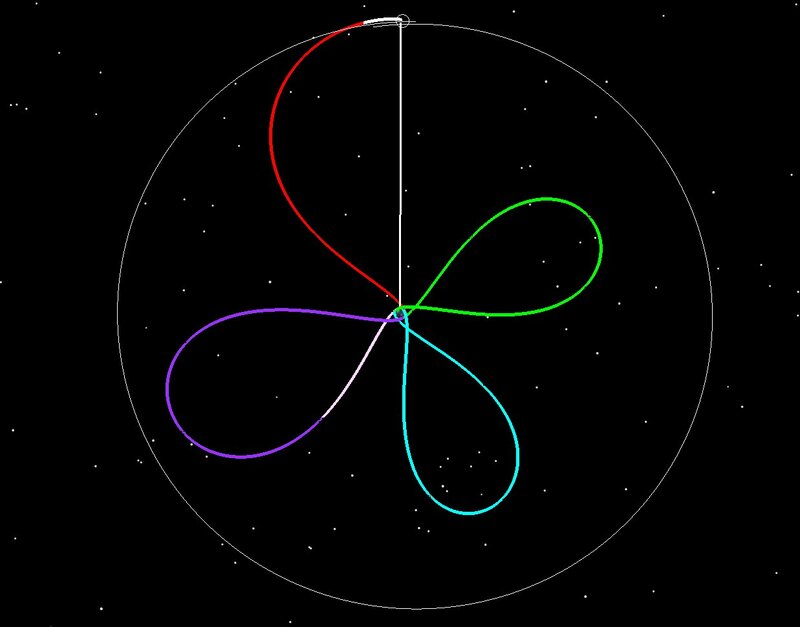 The LADEE OD team compares the orbit prediction (Purple) from a few days ago with the current solution (Green), making sure that the predictions are accurate enough to support communications and LLCD pointing activities. 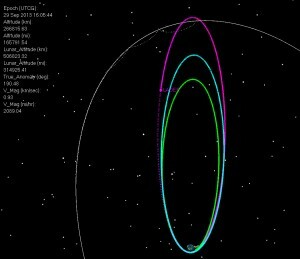 After we get an orbit solution, we then go through a lot of self-consistency checks to convince ourselves that our orbit is good, and we check our previous predictions with new data to see how well we are doing (as shown in these figures.) 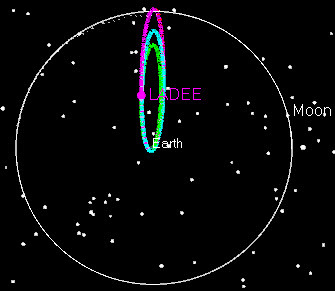 It is frustrating, though, that we can’t just look out a window and see where LADEE really is! Sometimes it seems like we are flying a remote control airplane with a blindfold on, maneuvering by only listening to the sound of the engine as it gets closer or farther from us! Every once in a while, though, we get a good indication that things are going well. 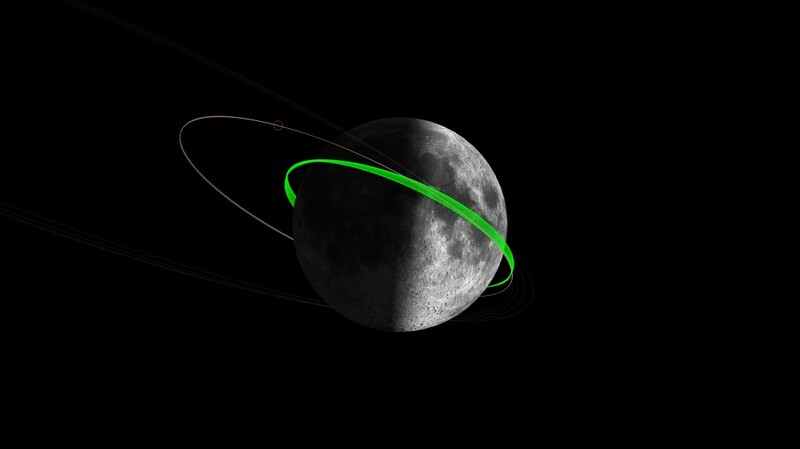 For example, when we were getting ready for our first Lunar Orbit Insertion burn, we were sure everything was going well, but there’s still a lot of anticipation in the air…. 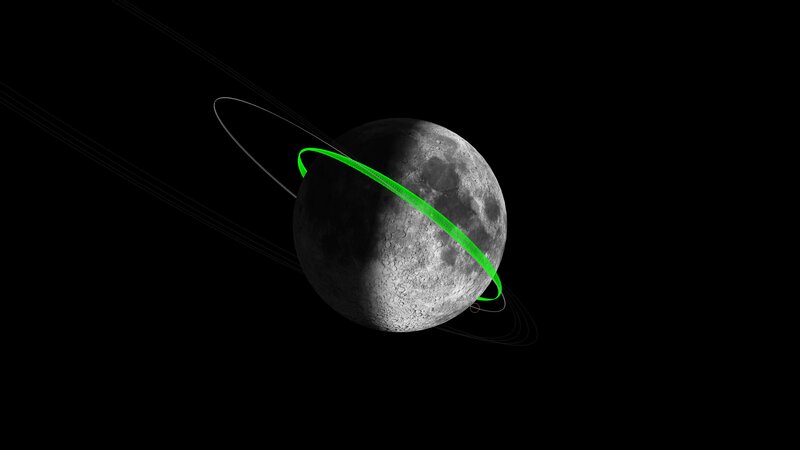 we were leaving the Earth’s dominating gravity, and falling rapidly towards the Moon. (“Falling with Style” as Buzz Lightyear would say!) We designed LADEE’s trajectory to go behind the Moon and—based on our predictions—we planned the exact time for the main engine to fire to brake into Lunar orbit, igniting just a few minutes after LADEE became visible again from behind the other side of Moon. We sure hoped we got the prediction correct! 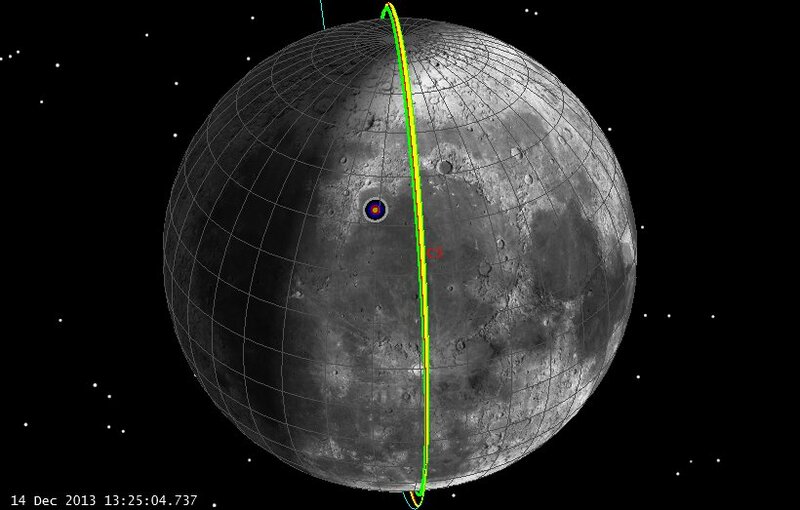 In addition to estimating the time LADEE would lose signal as it disappeared behind the Moon, we also estimated the uncertainty in that time; we predicted we knew the time within 2 seconds. We were listening to the other team members on the voice loop, and we cheered as they called out that the Loss Of Signal was within 2 seconds of our prediction! 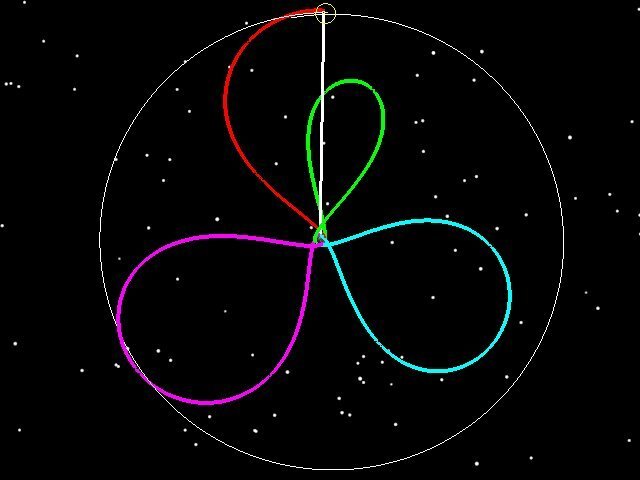 The LADEE OD team calculates the uncertainty of each orbit solution. One consistency check we perform is to see that the difference between the predicted and final orbit estimates are close compared to their uncertainties. 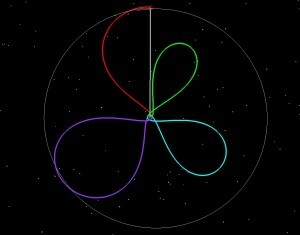 The uncertainty of the predicted orbit is shown in Purple, and the uncertainty of the current “definitive” solution is in Green. 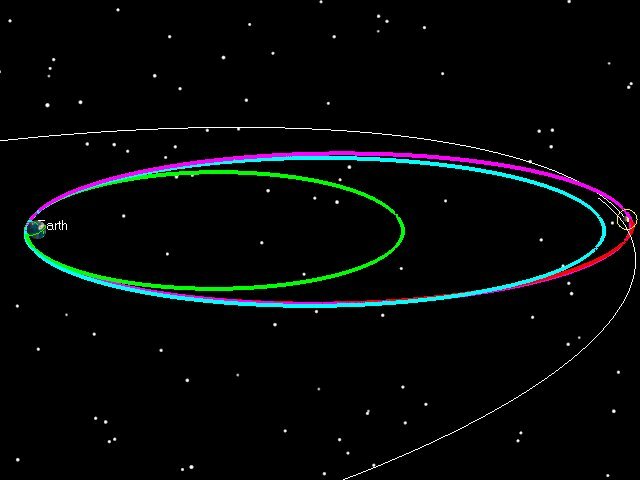 In this case, the final definitive orbit and it’s uncertainty is completely within the predicted uncertainty. This is an indication that the prediction a few days ago is still good to use now. “We thought the ground terminal would have to do a little searching, but it turned out it was pointed perfectly,” Boroson says. “We turned it on and all cheered.” The connection was almost instantaneous. 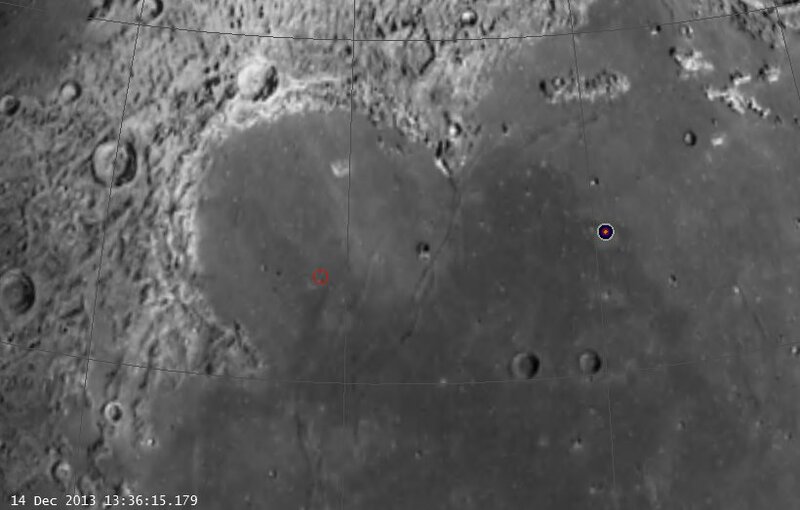 After the spacecraft and ground terminal connected, a 4-inch laser beam travelled 238,000 miles from the moon to New Mexico. Over the 239,000-mile distance between the Earth and the moon, the 4-inch-diameter laser column disperses to a width of 3.5 miles by the time it reaches the ground. 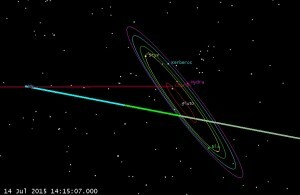 There was really little room for error: the pointing had to be correct, and the predicted ephemeris has to be accurate. Although we had done several tests prior to launch, sending test products to check out the system, we didn’t know how things would work until they turned on the LLCD system. 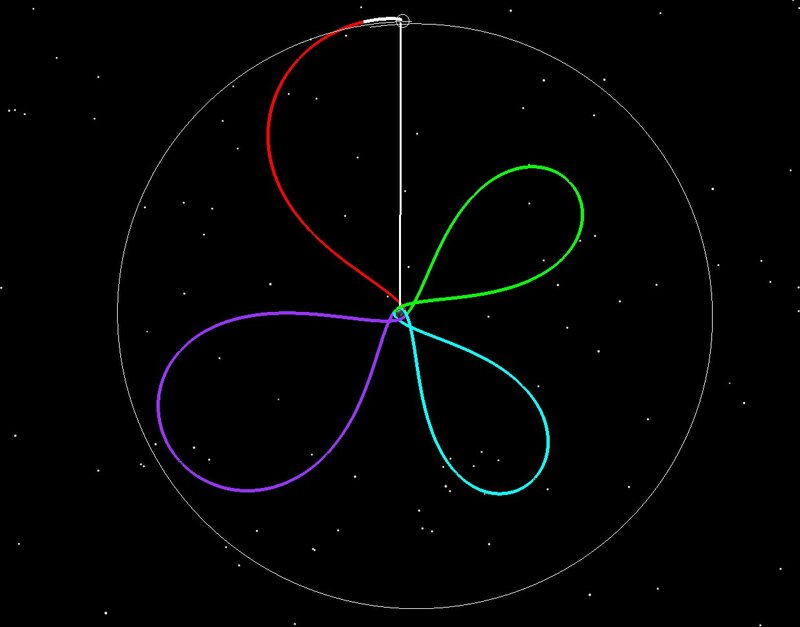 You can imagine when we heard over the voice loops and in the status briefings last weekend that the orbit ephemeris was good enough that the system worked right away, and that they didn’t need to search, we were very excited! Our LADEE Orbit Determination lead, Lisa Policastri, visited the NASA Wallops Flight Facility prior to launch. 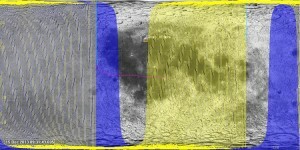 She is standing here in front of the LADEE display, and you can see the LLCD display on the left. 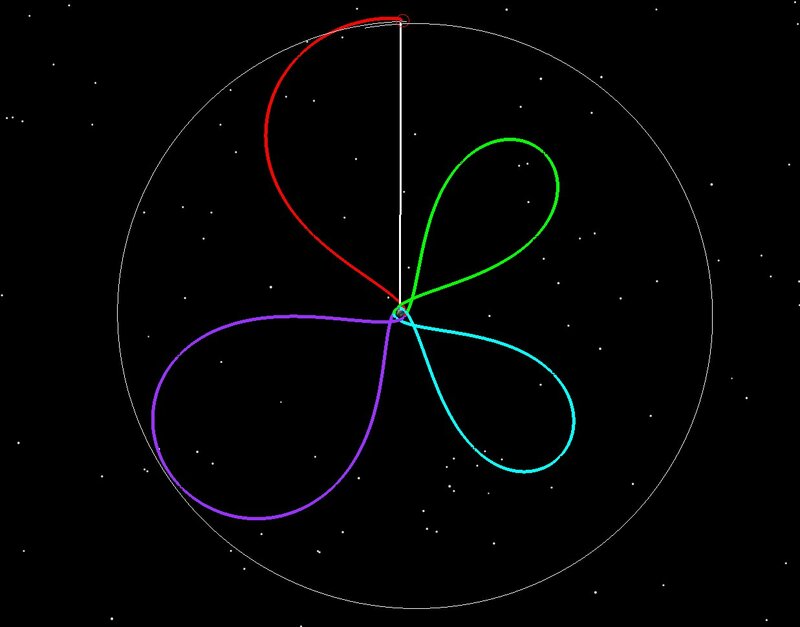 The orbit determination team really did their job! 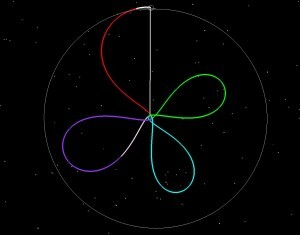 And, in addition, our nine-person Flight Dynamics Team performed several other tasks to make the LLCD experiment work. 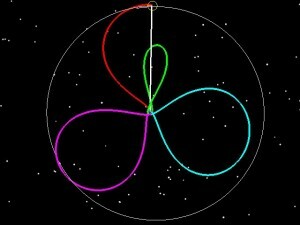 We calculate the orientation (also called the “attitude”) of the spacecraft for the experiments. We also create the on-board spacecraft ephemeris so the LLCD instruments mounted on LADEE know where and when to point back at the ground terminals on Earth. 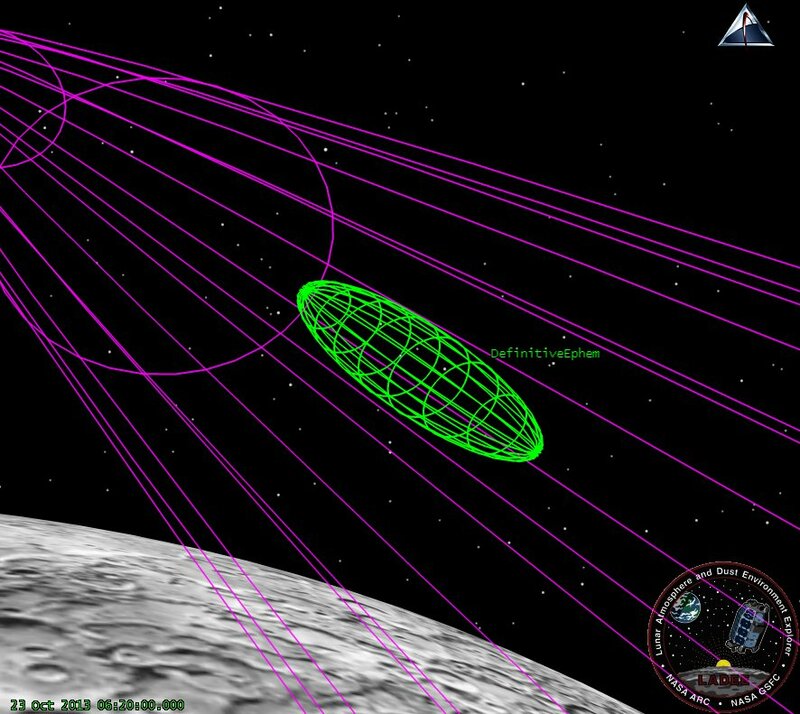 And we generate the pointing angles for the ground terminals to point their LASERS at LADEE. Of course, we’re not the only ones… Our flight dynamics team sits in the room next to the activity planners, and the many sub-system engineers, and we are near the controllers, and the many other folks that worked through the weekend and over long nights at Ames to make this successful. It was an exciting weekend! And that’s just listing some of the folks at NASA Ames. To see the rest of the LLCD team, check out the web page http://llcd.gsfc.nasa.gov – It really is great to see what can be accomplished when so many people, of very different talents, have a chance to work together, and try something new. Sorry for the delay in updating, Astrogator_Mike had to make the long drive home after LOI-3 and get configured back in his home base. 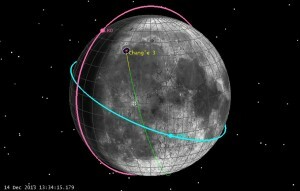 In the mean time, Lunar Orbit Insertion Burn 3 (LOI-3) was completed successfully (within 0.6% of target) on Oct. 13, 2013. 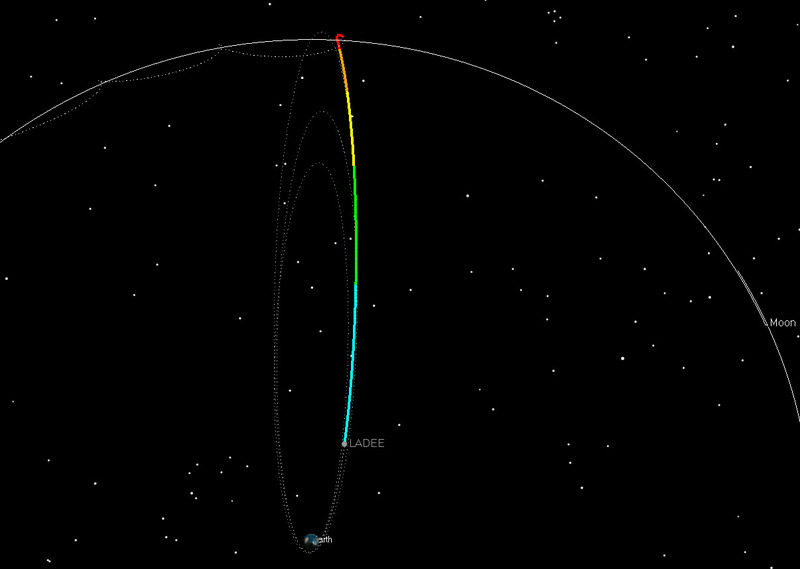 LADEE’s post LOI-3 orbit had an aposelene altitude of 250 km, and a periselene altitude of 235 km. You can see below that this has evolved over time to 220 km x 260 km. 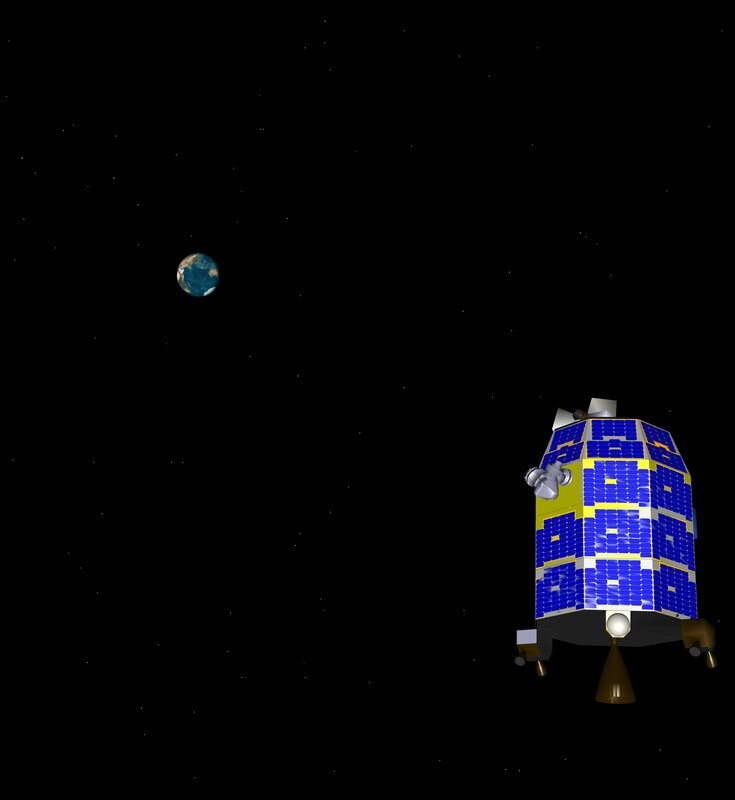 LADEE will now stay parked (i.e. no maneuvers) for roughly a month, while the spacecraft does alternating Lunar Laser Communication Demonstration (LLCD) tests, and calibration tests of the other science instruments. Note that you can zoom in on any of these pictures by clicking on them. We understand that the twitter account is an unofficial site for lunar impact flash even monitoring by amateur astronomers in Japan to support the LADEE mission. The LADEE effort to involve amateur astronomers all over the world is supported by NASA, and I’d give you the link to their site about this, except that the site (like the rest of the US government) is offline. So try this link instead. 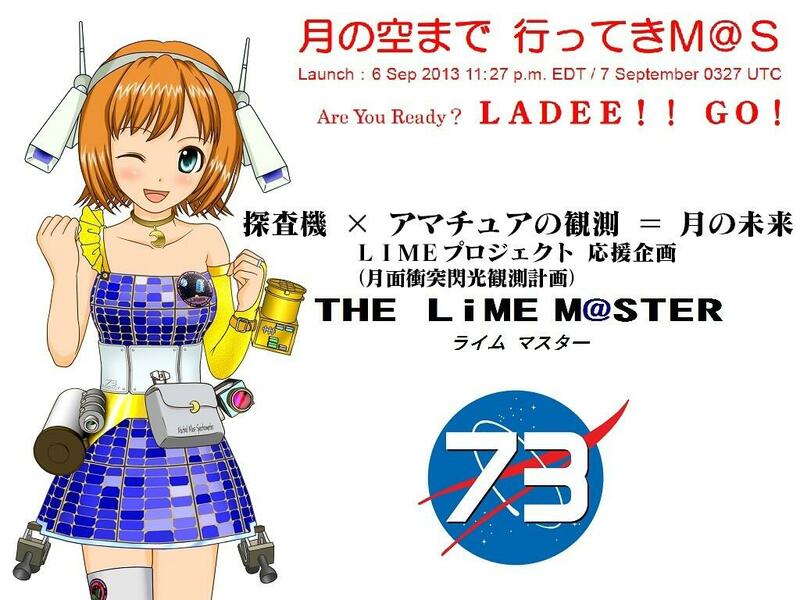 We also have been told that the LADEE girl in the picture ( the LIMEM@STER) is a parody of a Japanese-made game called THE IDOLM@STER. You can see a bit of that here. 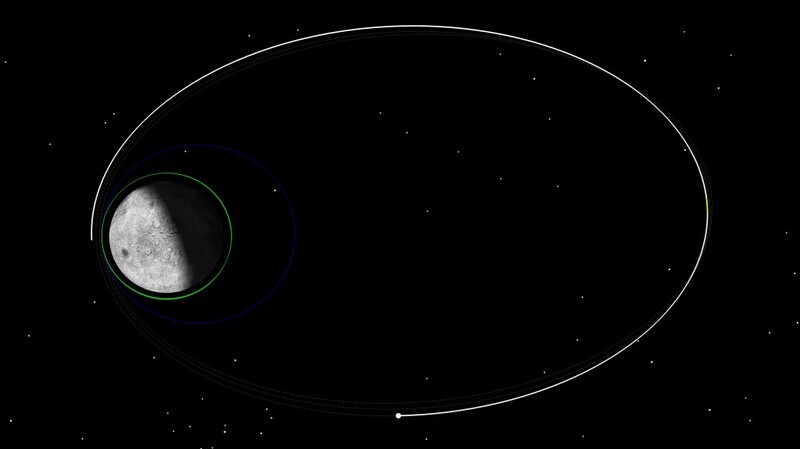 The LADEE Lunar Orbit Insertion burn 2 (LOI-2) executed as planned this morning at 3:38 PDT, placing LADEE into a 4 hr orbit. Things move much faster now for the spacecraft, and the Moon is looking a lot bigger. 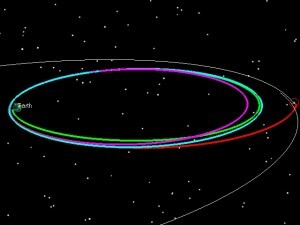 We originally captured with a periselene altitude near 560 km but our periselene has now been lowered to an altitude of ~235 km by Earth perturbations in the Post-LOI-1 24 hr orbit. 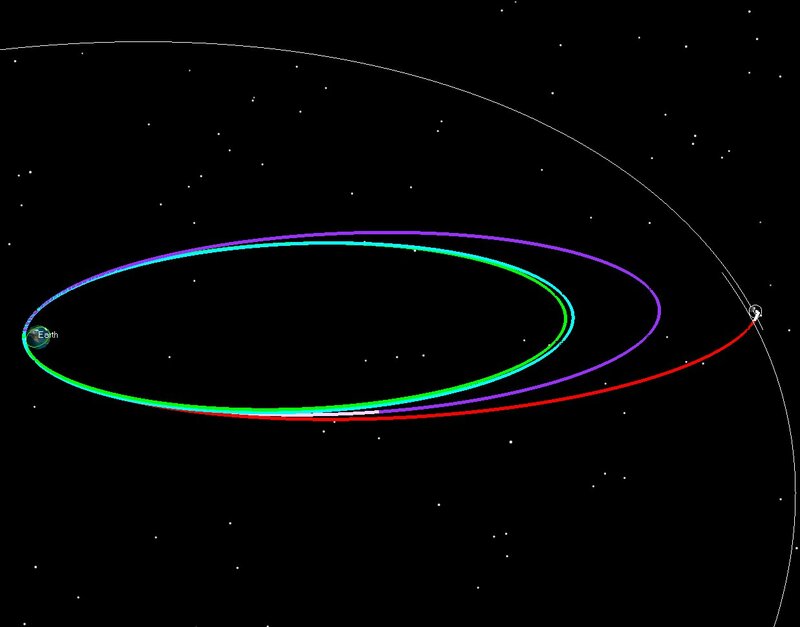 The planned periselene of the commissioning orbit was 250 km, however the small (<1%) underperformance of LOI-1 caused aposelene to be slightly higher, and thus we got slightly more Earth perturbations than we nominally planned for. The result of this is that we got a bit of free lowering from the Earth, which we’ll take! (Since we plan to go lower than 250 km anyway). 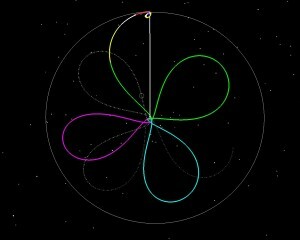 So the current plan is to drop the aposelene to 250 and perform commissioning there in the 235 x 250 km orbit. 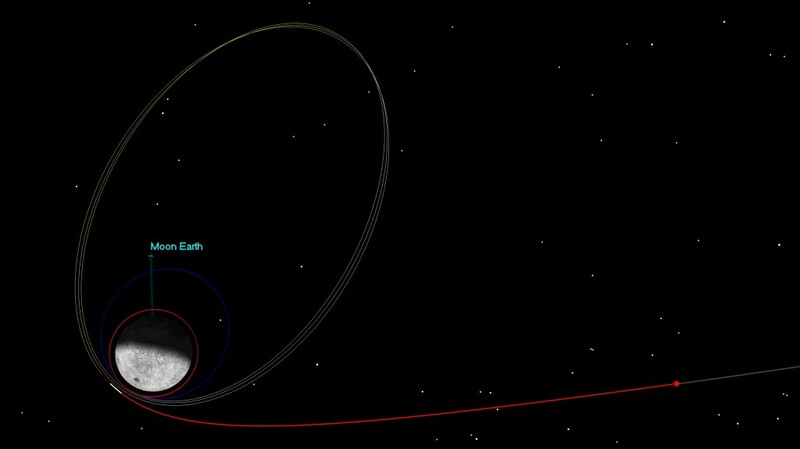 The maneuver will last for 220.8 seconds, and will impart a delta-V (change in velocity) of 293 m/sec. 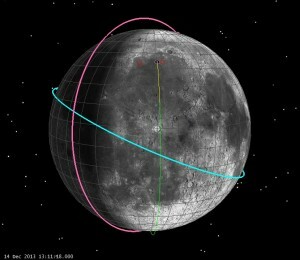 So if you go outside tonight and see the Moon, imagine this orbit. 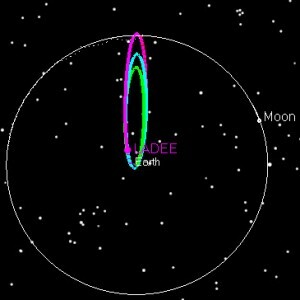 After posting the picture of the Moon from the parking lot at Ames, we thought it would be cool to see what LADEE’s orbit would look like, if we could see it, from the Earth. 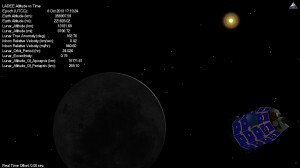 The picture below is from the Earth to the Moon, with Ecliptic North at the top. 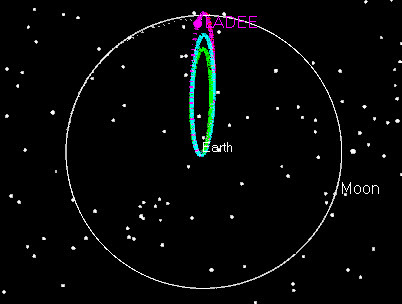 The White Orbit is our current orbit, and the small white circle is where LADEE was when I took this snap… it’s moving to the right, towards periselene; the Blue Orbit is what it will be after LOI-2, and the Green Orbit is the near circular orbit we will stay in during commissioning for about a month before we start science operations. 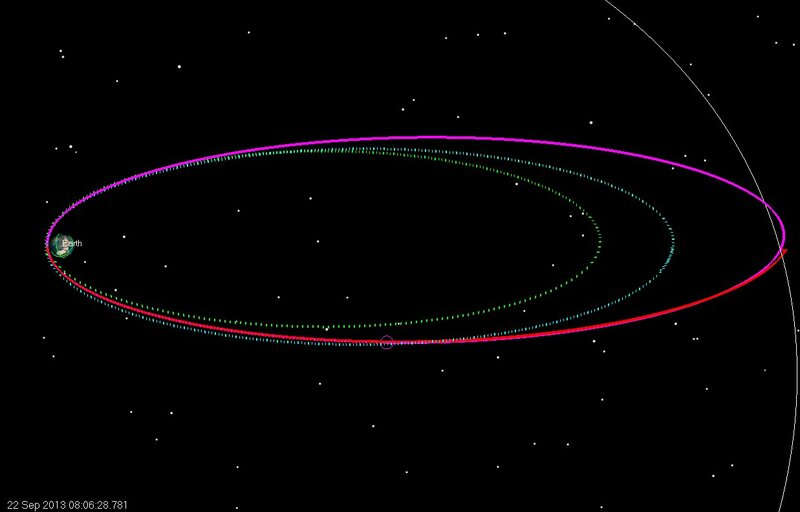 Astrogator Mike is in the Flight Dynamics Room planning our second lunar maneuver, Lunar Orbit Insertion-2 (LOI2), and I (Astrogator John) am processing tracking data doing orbit determination. 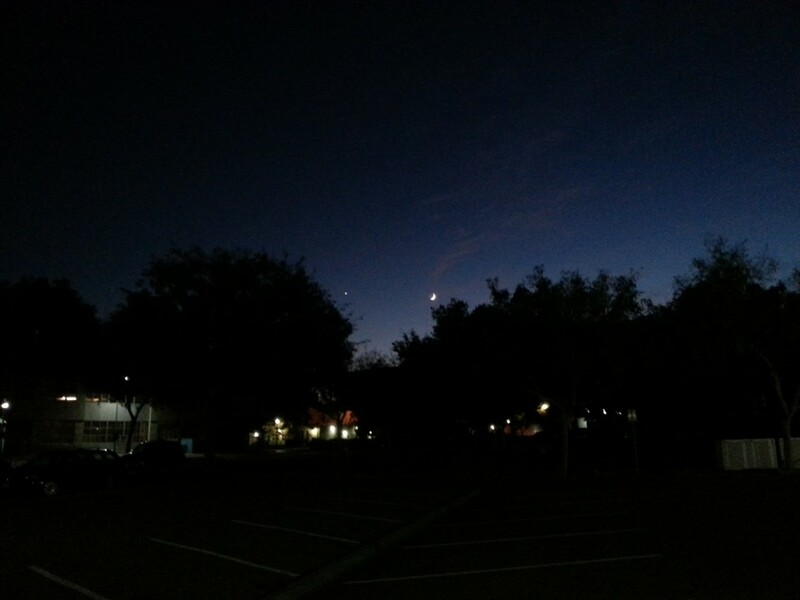 Mike noticed the Moon and Venus over the parking lot, so I went out there with him took this picture with my phone. That’s Venus to the left of the Moon. 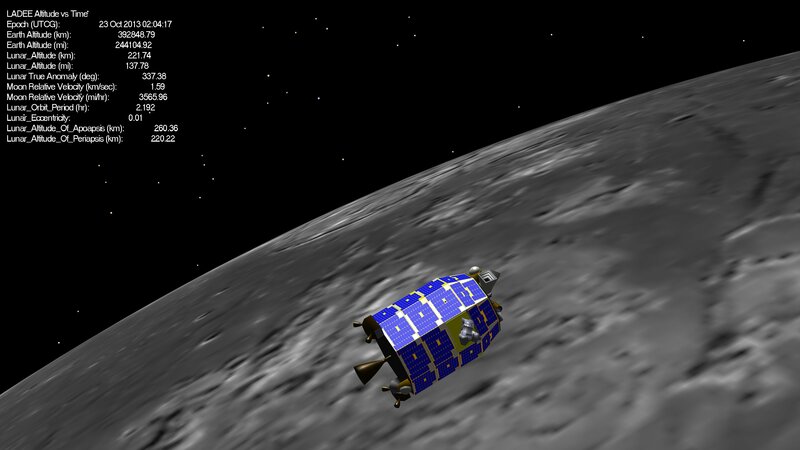 The LADEE Spacecraft successfully performed Lunar Orbit Insertion maneuver 1 (LOI-1) on Oct. 6, 2013 3:57 PDT. 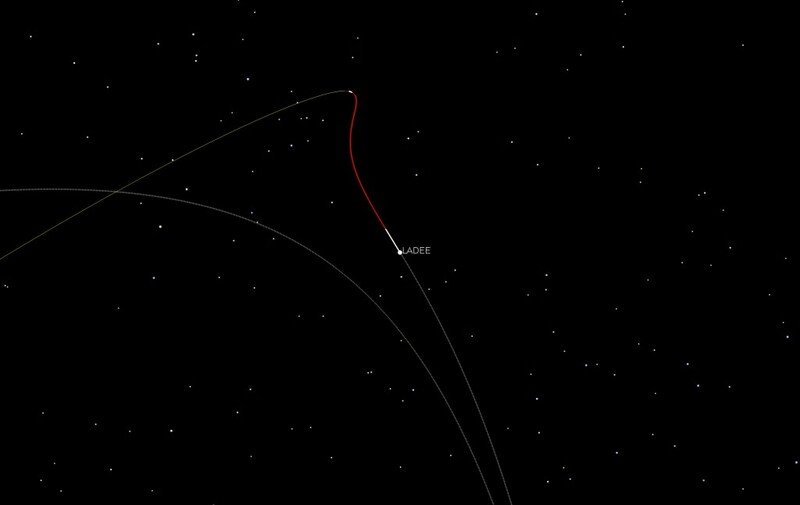 The LOI-1 maneuver captured LADEE into a 24 hr orbit. 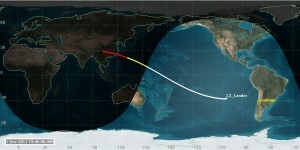 After 3 days (and 3 revs) in the capture orbit, the spacecraft will perform LOI-2 on Oct. 9 at 3:37 PDT. The second of 3 Lunar Orbit Insertion maneuvers, LOI-2 will reduce LADEE’s orbit down to a 4 hr orbit. 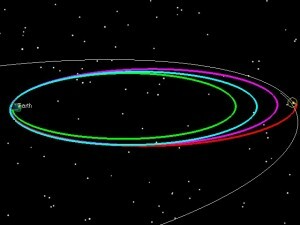 Finally, LOI-3 will be performed Oct. 12 at 8:00 PM PDT to circularize the spacecraft in a 235 km orbit. 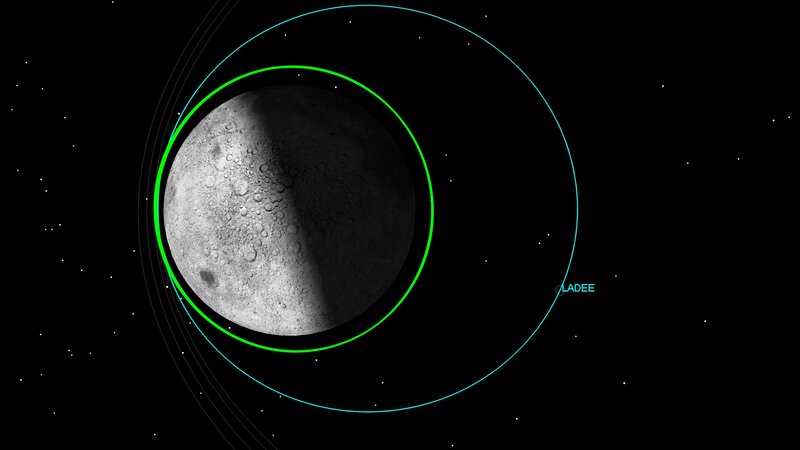 LADEE will spend a month in this “commissioning” orbit, while the spacecraft is checked out before full-time lunar science begins, and the Laser-Communications experiment will be tested. 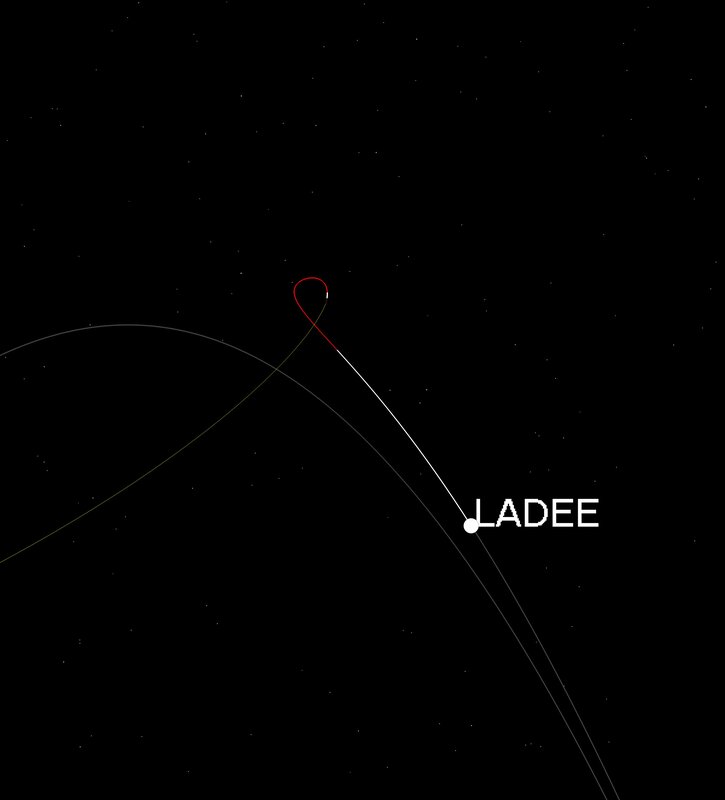 At this time (7 Oct. 2013 7:53) LADEE is past its first aposelene, and is headed for its first periselene after capture. 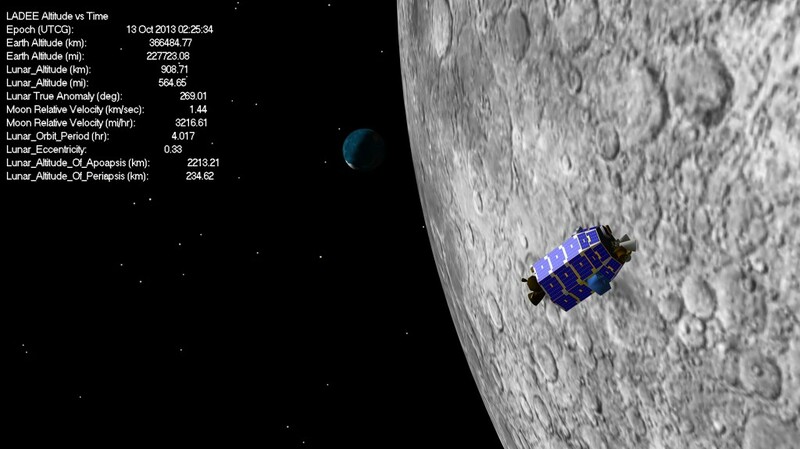 The LADEE spacecraft is now in Lunar orbit. 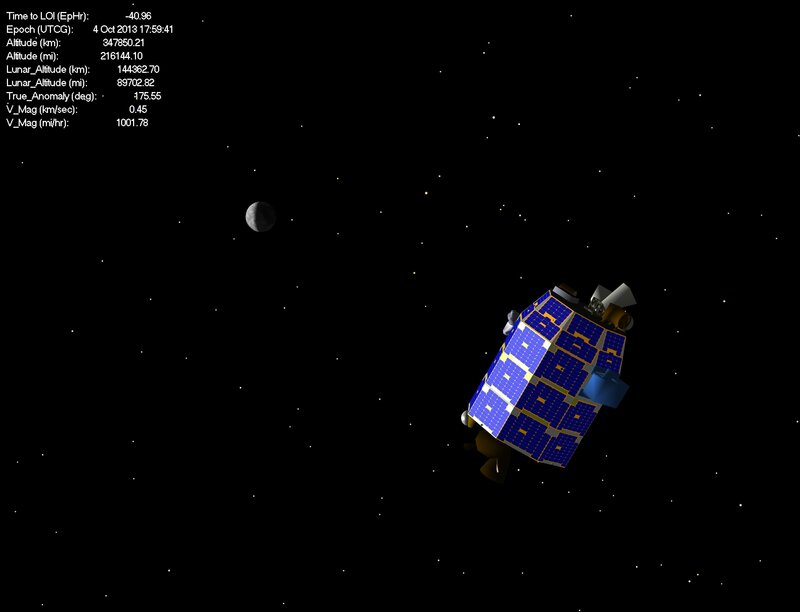 Tracking data will later confirm the precise parameters of the orbit, but based on telemetry of thruster performance and accelerations, the LOI-1 burn appears to be close to nominal. The planned Lunar orbit has an orbit period of 23.1 hrs. 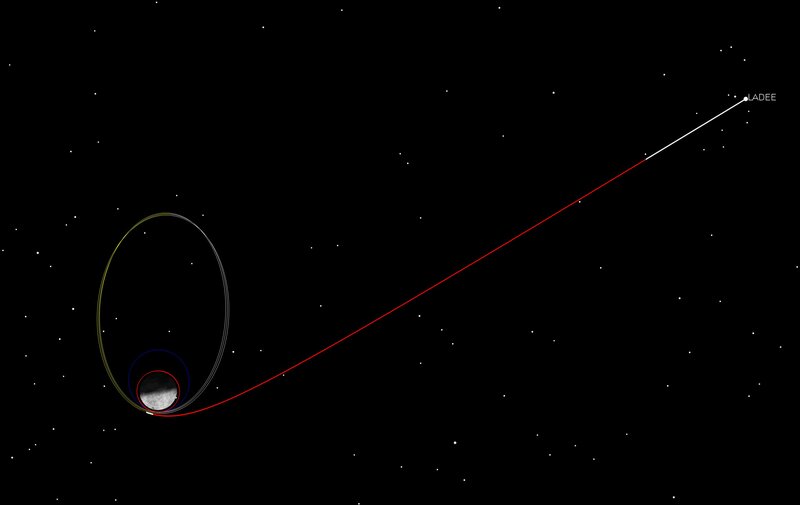 The next planned maneuver (Lunar Aposelene Maneuver 1, or LAM1) is scheduled for the 2nd aposelene, which would occur roughly 1.5 days from now. For LOI-1 results close to nominal, this maneuver can be waived. LOI-2 is nominally scheduled for 3 revs after LOI-1. 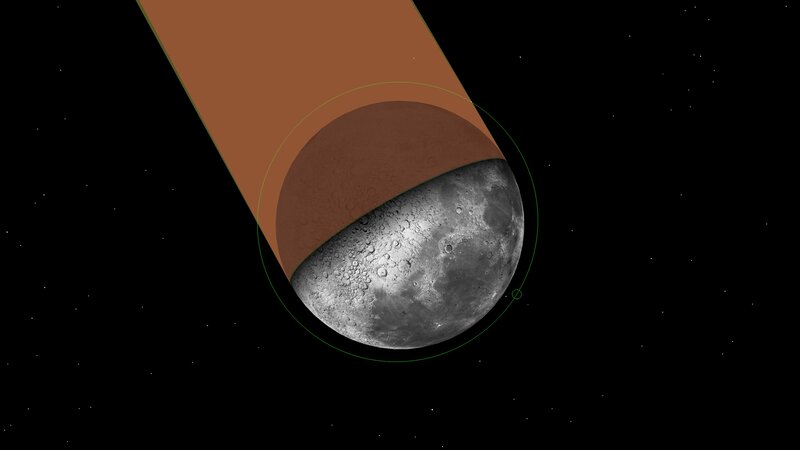 Watch the Lunar Orbit Period and Lunar Apoapsis Altitude come down once the Lunar Eccentricity goes below 1.0 (from Hyperbolic to Elliptical). 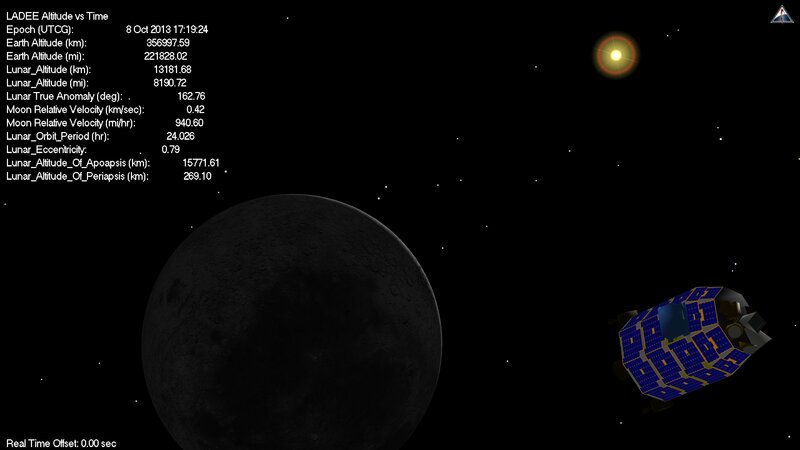 The Moon is now under control. 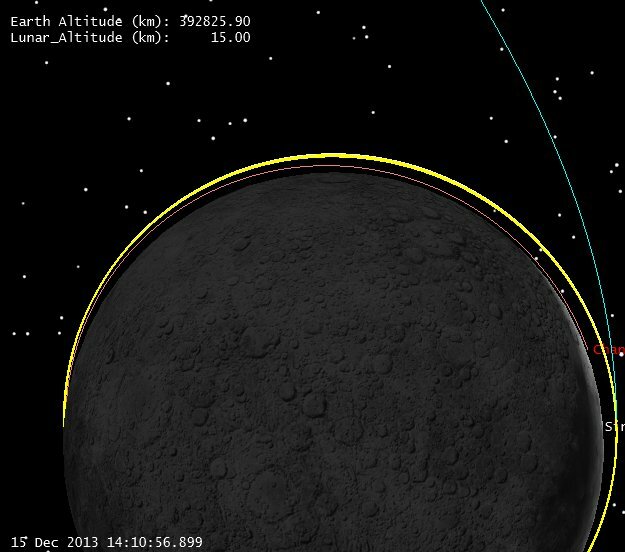 Based on LADEE’s altitude (below 66,000 km) the Moon is now the primary gravitational body acting on the spacecraft. 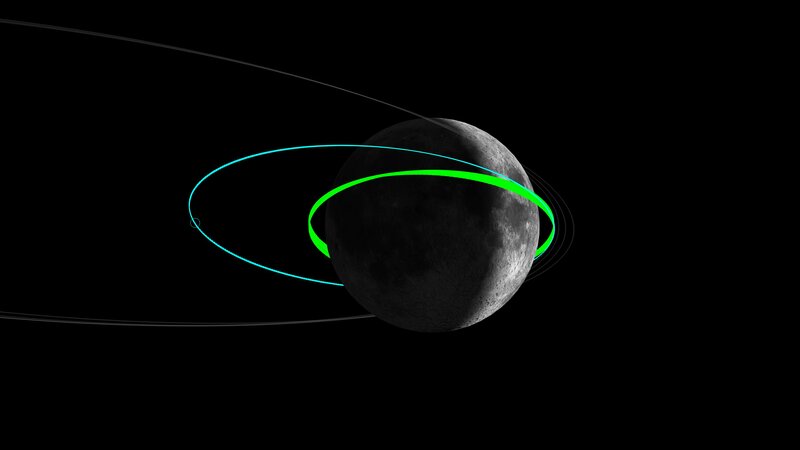 In other words, the Moon’s gravity is now stronger than the Earth’s. 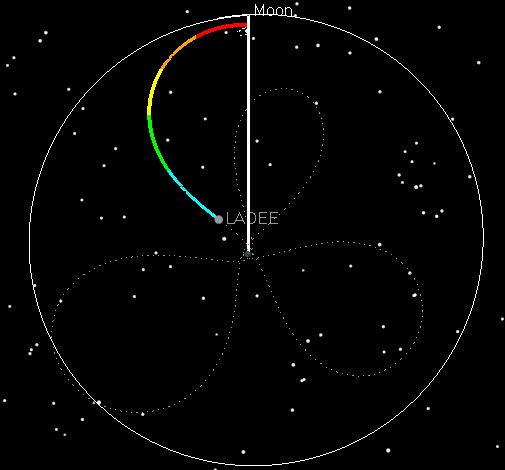 Note that the white arc LADEE is currently on turns red when LADEE gets below 50,000 km. 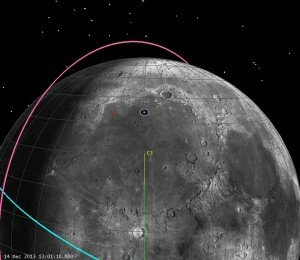 After that, you can see another short, white arc on the trajectory which is Lunar Orbit Insertion 1, or LOI-1. 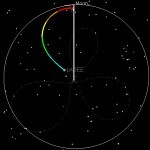 You can see the LOI-1 arc in this view as well. About 15 hrs to LOI-1 now…. 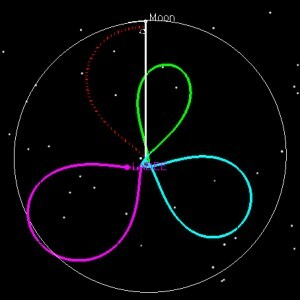 This figure, created a few days ago, shows the Earth- and Moon-centered orbit estimates. It also shows the uncertainty in these estimates. 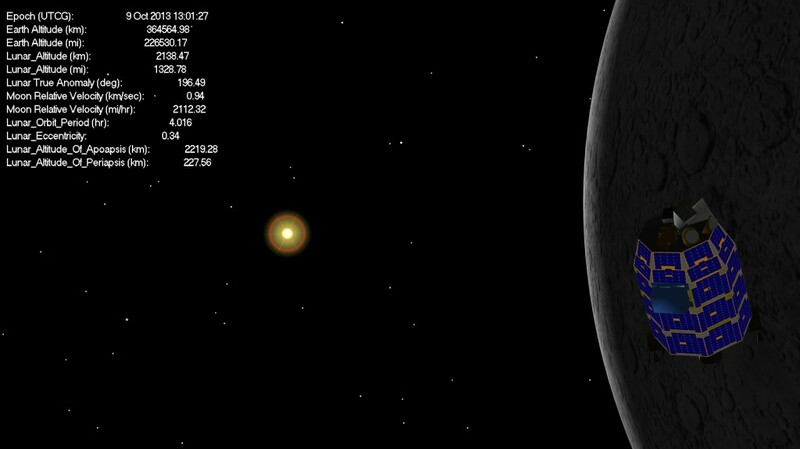 The uncertainty is very small, although it’s hard to see the scale in this picture since we zoomed in to show it. 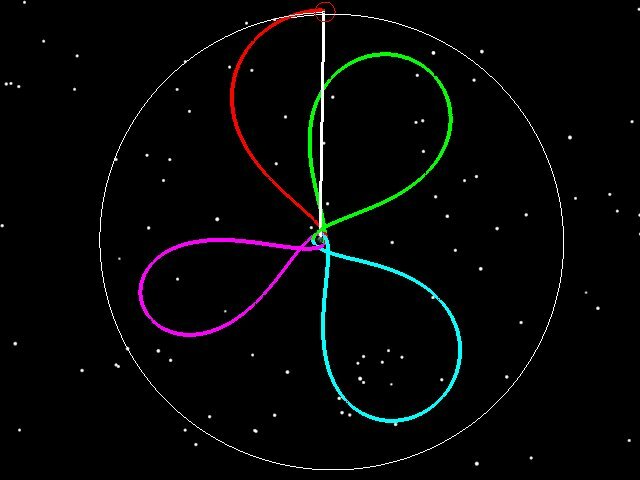 The uncertainty is shown as a 3 dimensional region in space that represents where LADEE is most likely to be. The region in the picture is only a few hundred meters long, using the estimate from several days ago (it’s smaller now). In addition to calculating the trajectories, we also have to track LADEE and estimate the orbit, using a technique called “Orbit Determination.” Fellow Astrogators Lisa Policastri, Ryan Lebois, and Craig Nickel work with us on this. 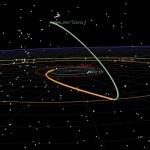 The method we use is an Extended Kalman Filter, which processes tracking data sequentially as we receive the data from the tracking stations around the world. 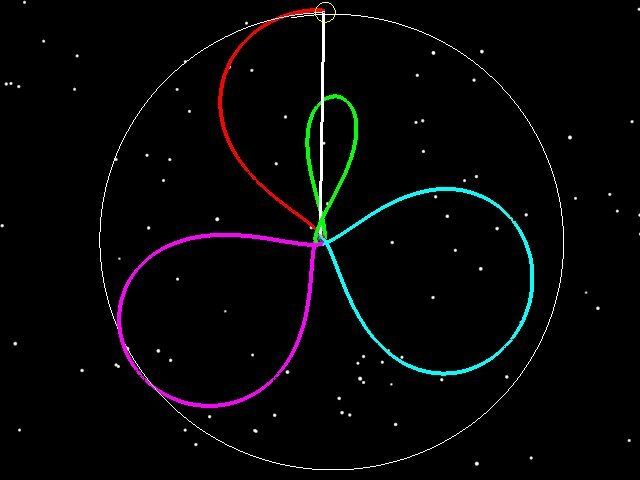 Orbit Determination is sort of like curve fitting, and one of our jobs is to estimate the trajectory that best fits the tracking data. 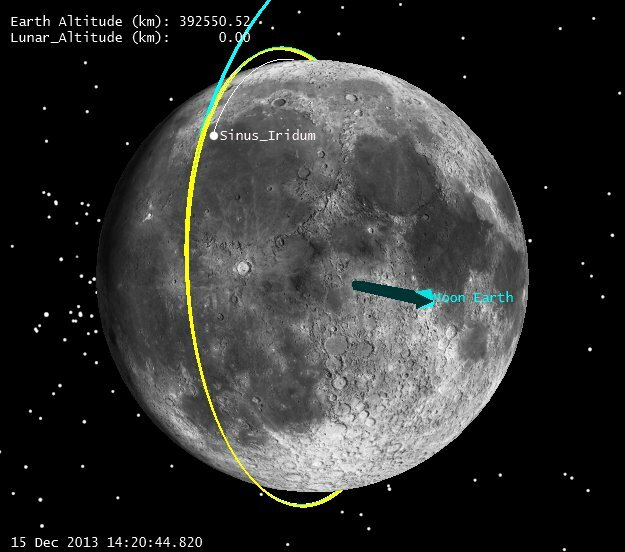 As you can see from the pictures we’ve posted previously, LADEE’s trajectory bends a lot as it goes from the Earth’s influence to the Moon’s. 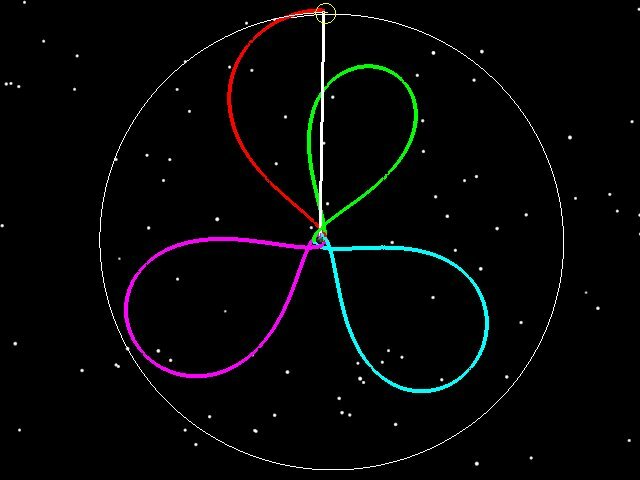 To model the changing gravity for Orbit Determination, we decided to do something different than we do for trajectory design. 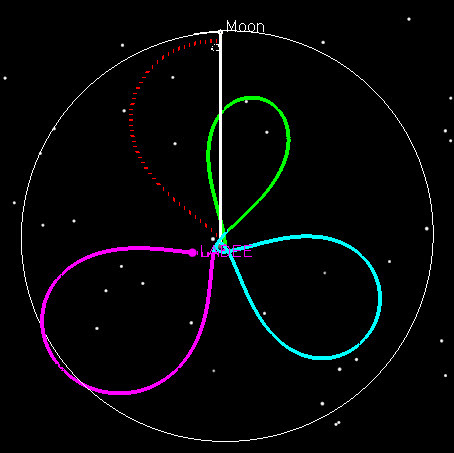 Instead of switching from Earth-Centered to Moon-centered at a specified point, a few days ago we started running two algorithms side-by-side; one Earth-centered, and one Moon-centered. 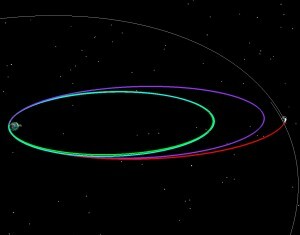 We trend the two different orbit estimates, and by the time we reach the LOI1 maneuver (6 Oct 2013 10:57 UTC), which is just past periselene, we will be ready to transition to using the Moon-centered algorithm for the rest of the mission. 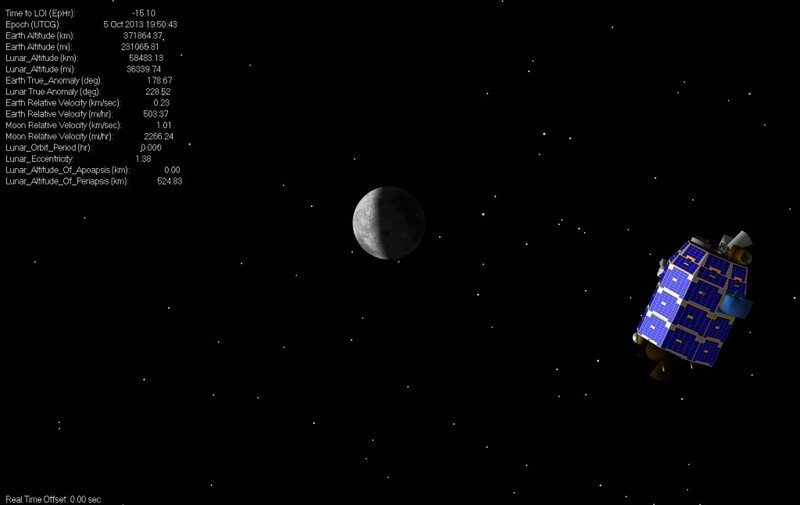 LADEE continues to approach the Moon, now nearing 100,000 km in altitude. 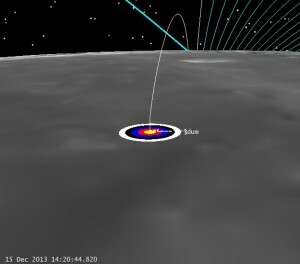 LADEE is rapidly approaching the Moon. 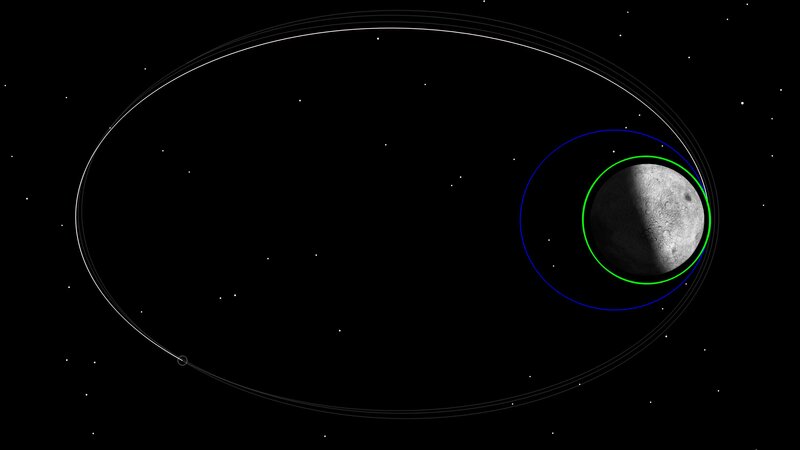 Depending on who you talk to, you can consider the spacecraft to be within the “Sphere of Influence” of the Moon somewhere near 66,000 km (on LADEE we switch central bodies on our numerical integrators at 50,000 km, but that’s not a magic number). So we’re not quite Moon-Centered yet, but that doesn’t stop us from giving you pictures in a Moon centered frame. 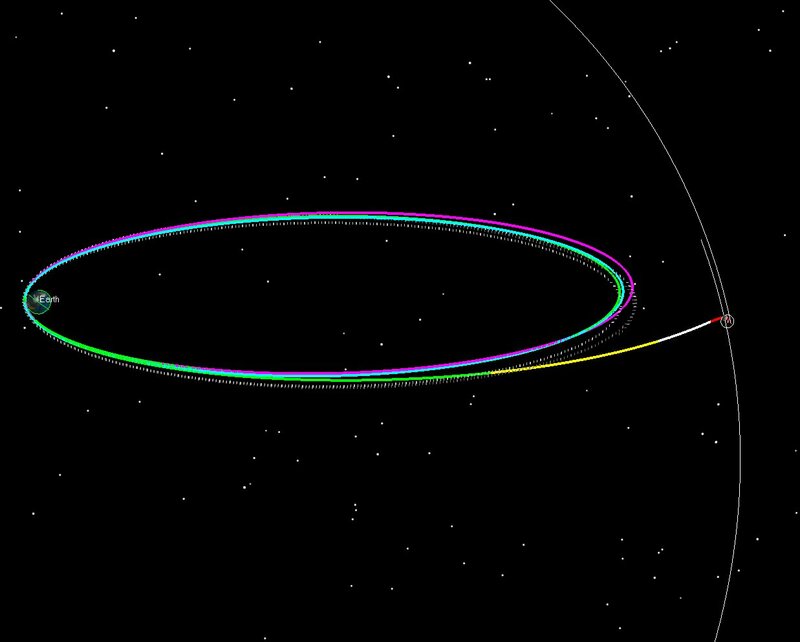 [Note: Velocity is still Earth-relative] I have to still show my favorite view of the phasing loops, the Earth-Moon rotating coordinate frame, but Earth-bound phasing loops are about to be less relevant. If you check the dates on the pictures, you can see what order I created them in, as the dates don’t all match and I’m animating in real time. 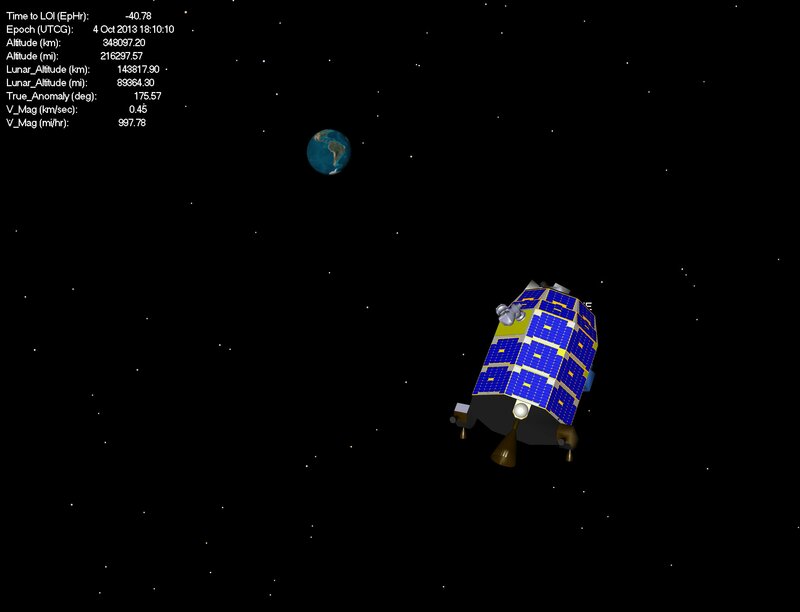 LADEE now under the GEO belt, and heading for its last perigee. Next Maneuver: TCM-1 on 1 Oct. 2013 22:00:00 UTC (11 hrs after Perigee 3). 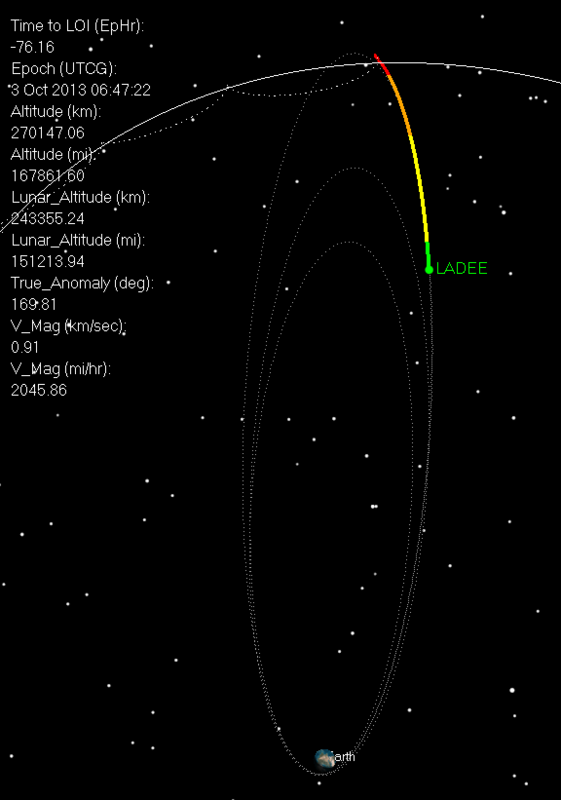 On Sep. 28 2013 05:33 UTC, LADEE is coming out of its last apogee and at an altitude of 214,000 km. Perigee occurs on 1 Oct near 11:00 UTC. 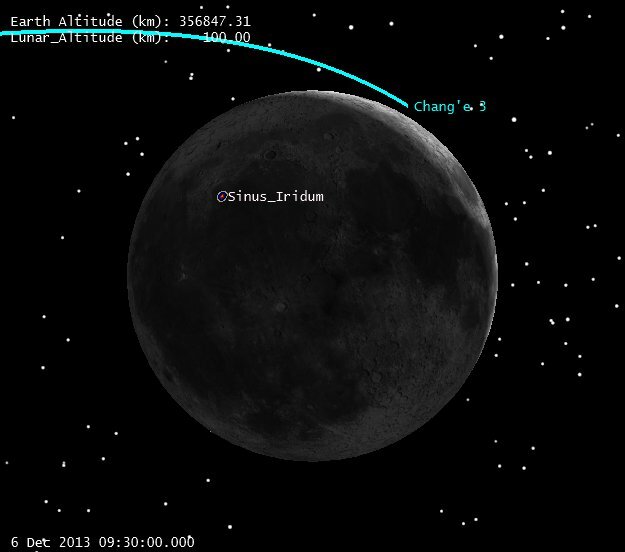 A final small midcourse maneuver will take place at 1 Oct 2013, 22:00 UTC. 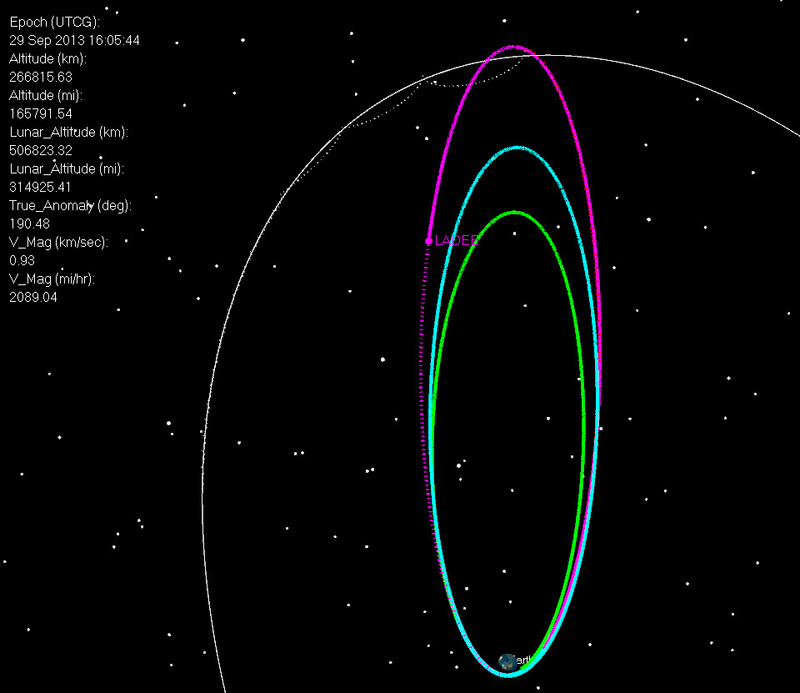 This 0.9 m/sec maneuver will precisely target insertion parameters for the 6 Oct. 2013 10:57 UTC LOI-1 maneuver. 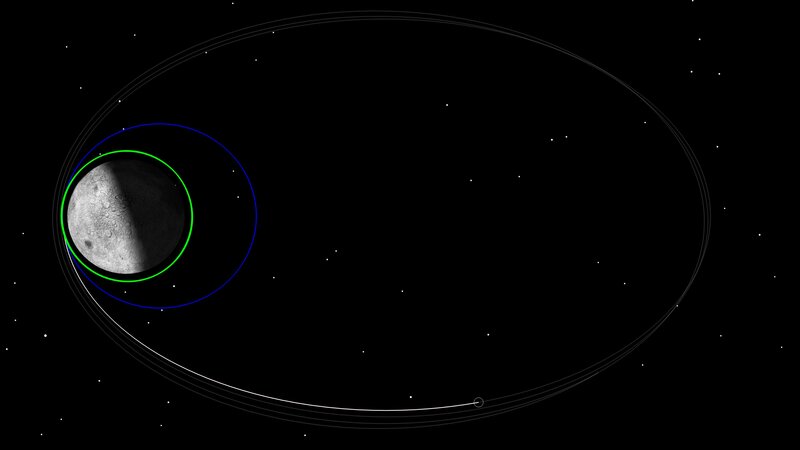 LOI-1 is designed to place the spacecraft into a 24 hr orbit, with a periselene altitude of 590 km [correction: previously I said 750 km, this isn’t quite right. For LADEE we aren’t capturing right at periselene, like orbital mechanics would recommend. Instead we burn off periselene just a bit. 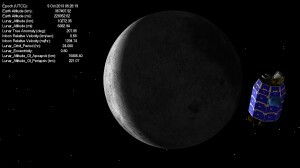 We wait until 5 minutes past we come out from behind the Moon, and start our burn. This ends up being roughly 5.5 minutes after periselene. This allows the Deep Space Network to get a lock on us and telemetry to start flowing before the burn starts. 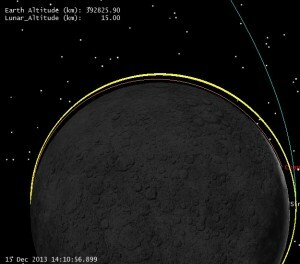 So the altitude at the end of this burn is at about 750 km, but the actual periselene altitude is closer to 590 km]. 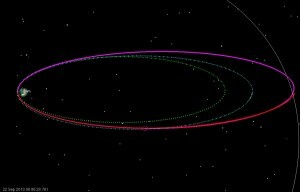 After 3 revolutions in this orbit, 3rd-body Earth gravitational perturbations will have lowered periselene to an altitude of 250 km (by design). 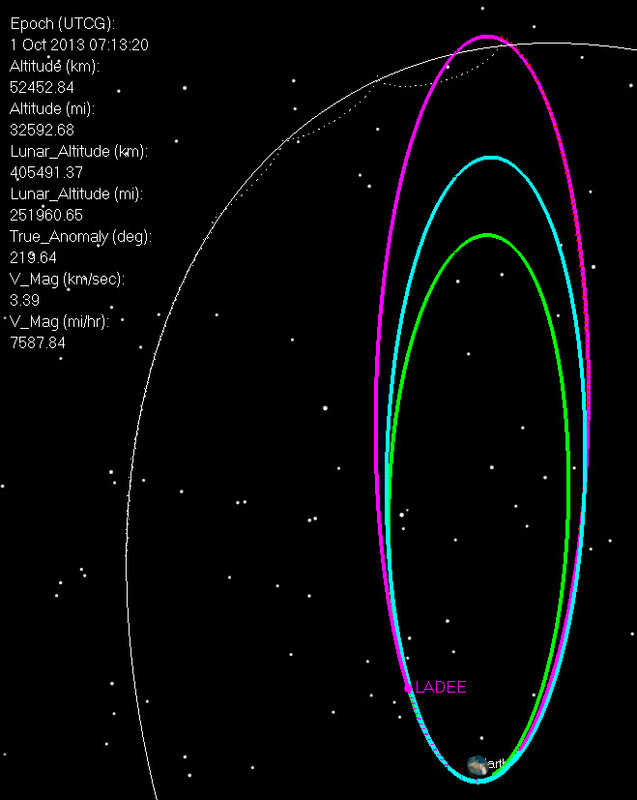 At this point, LOI-2 will be performed on 9 Oct 2013 10:37 UTC ( to place LADEE into a 4 hr orbit (also with a 250 km periselene altitude). LADEE will spend 3 days in this orbit until LOI-3 (12 Oct 2013 10:37 UTC), which circularizes the orbit at 250 km. 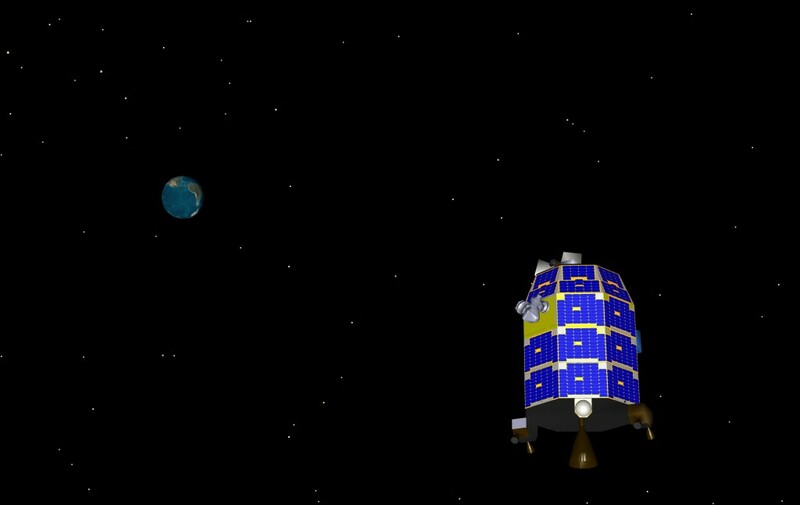 LADEE will spend 30 days in this “commissioning orbit”, and will also perform tests using the laser communications experiment (LLCD). The timing and magnitudes of the maneuvers leading to the commissioning orbit are given below. 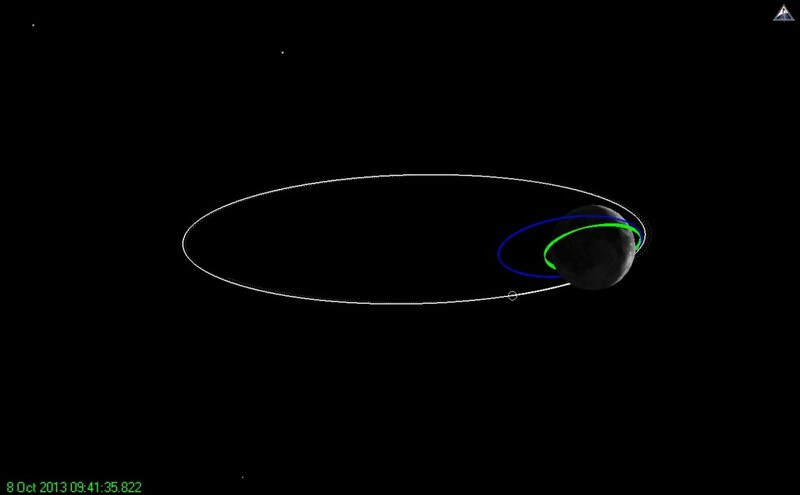 Here’s a quick LADEE update for Sept. 22, 2013. The LADEE team performed a second Perigee maneuver yesterday (21 Sep. 2013, 11:53 UTC) to raise LADEE’s orbit to have a period of 10 days, and to set up the spacecraft for Lunar capture on Oct. 6. 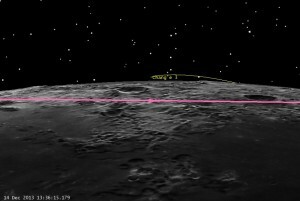 LADEE’s path to this point is shown in dotted lines, while the upcoming trajectory is shown as solid. Note that LADEE is now in phasing loop 3, and will continue around a full orbit that will conclude on October 1st. LADEE will then begin the final portion of its trajectory, the 5 day trip to the Moon which concludes on Oct 6 with Lunar Orbit Insertion burn LOI-1. No further deterministic maneuvers are required (only a small TCM to correct out statistical errors from PM2) before the LOI phase begins. 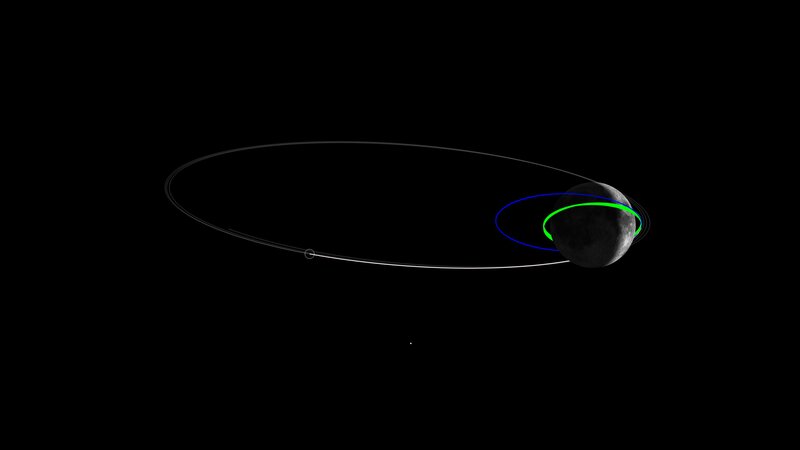 So even though LADEE has a full Earth orbit left, it is Moon-bound. LADEE is still in an elliptical orbit of the Earth, but at the next apogee LADEE will encounter the Moon. Many people have asked about LADEE’s trajectory, which uses 3 and a half “phasing loops” to get to the Moon. 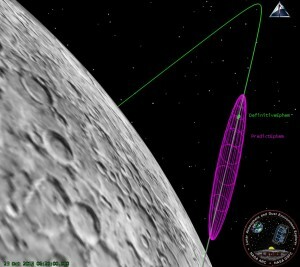 On one of my other postings, a reader asked if phasing loops saved delta-v on the trans-lunar injection (TLI) burn. The answer is no. 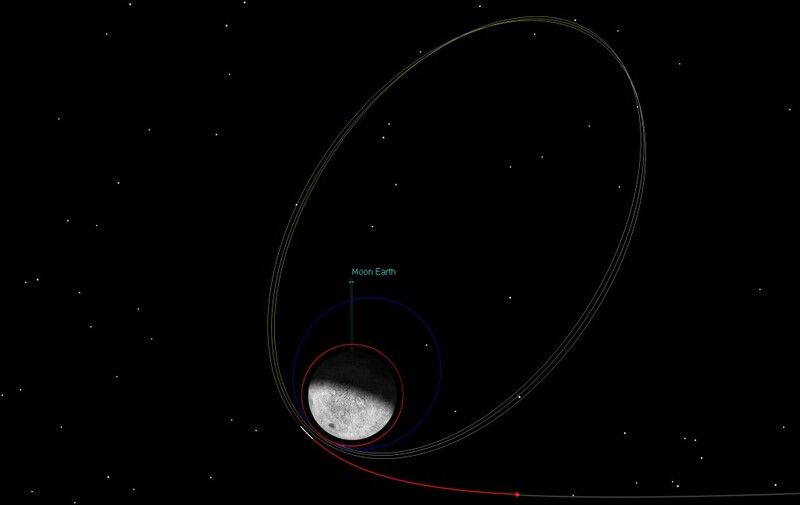 The cost (in delta-v) to get to a lunar transfer from a specific injection orbit (for example the 6.4 day orbit LADEE currently is in) is the same if you go direct as it is if you go around a few times first. 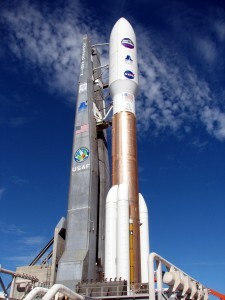 The savings come elsewhere, in particular with the cost of correcting for errors from the launch vehicle (rocket). 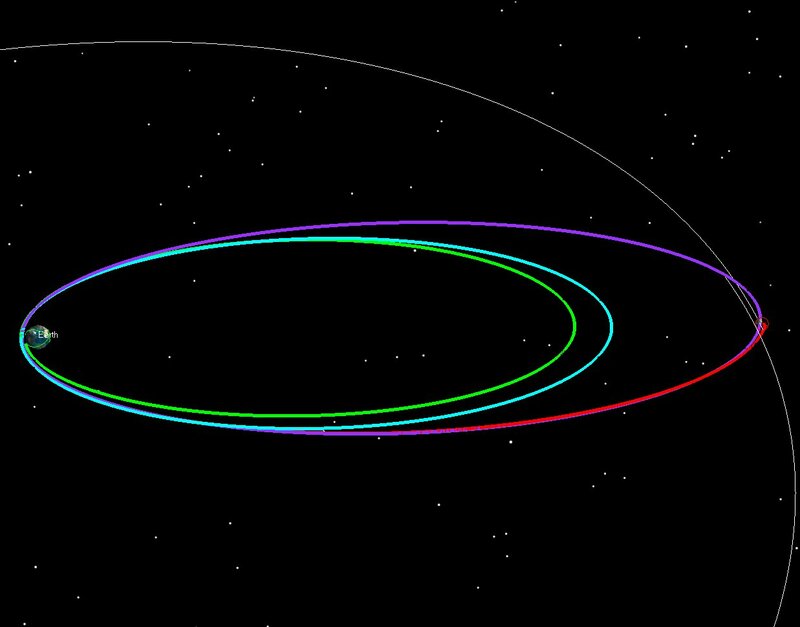 There are four important reasons why phasing loops are being used for LADEE. 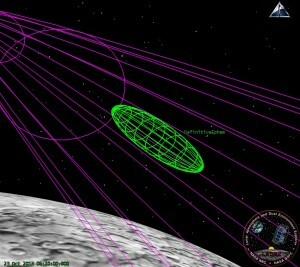 The Minotaur V couldn’t throw the whole mass of LADEE all the way to Lunar Injection. 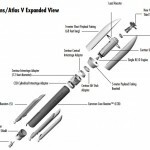 The Minotaur V, which is a stack of 5 solids, isn’t considered to be a particularly precise rocket. 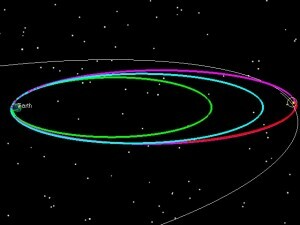 In other words, if we were to ask for a 6.3 day orbit, we might get a 5 day orbit, or we might get an 8 day orbit. 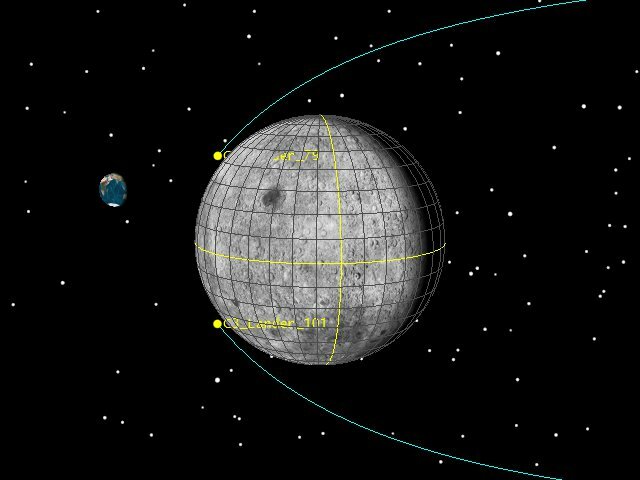 In a direct injection trajectory (such as the 3-day missions used by Apollo), injection errors can only be corrected out after good amount of tracking can be done (~ 24 hrs normally) to determine the orbit (OD, or “Orbit Determination”). 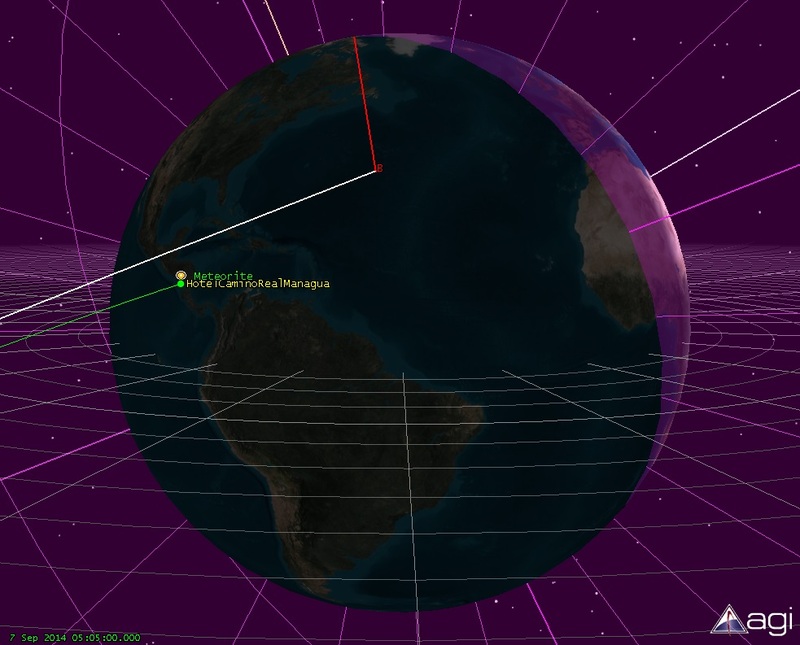 However, as the spacecraft gets further and further away from the Earth, the cost of correcting out launch errors gets larger as well. Often times, by the time enough tracking data can be gathered, the cost of correcting out any launch errors can be 5-10 times the actual size of the error. So a 5 m/sec error would take 25 m/sec to correct, etc. If, instead of using a direct approach, you use phasing loops the cost is a lot closer to 1:1 (i.e. 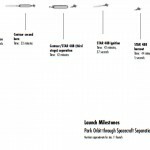 a 5 m/sec error in launch costs 5 m/sec to correct, or can even save you fuel). 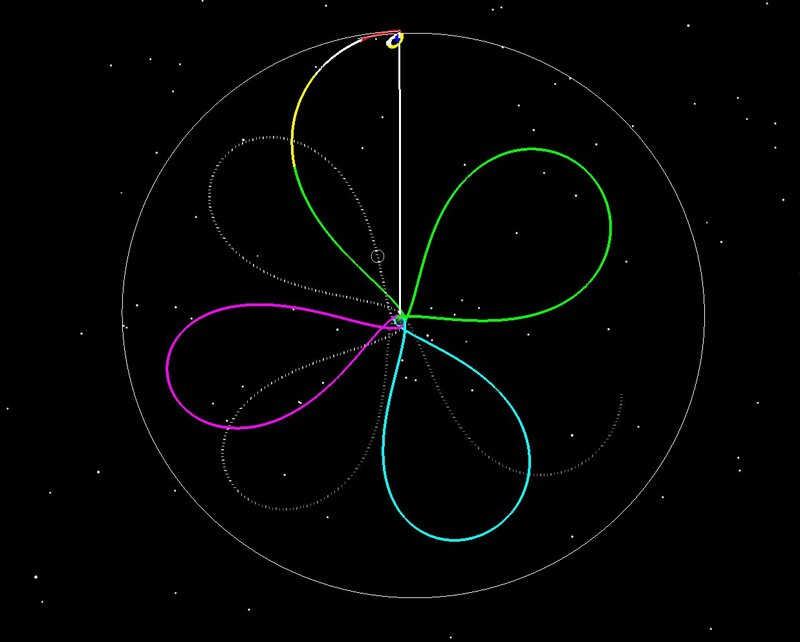 It’s not a pure 1:1 ratio, because there is a timing aspect as well, but in terms of the energy of the orbits, it is 1:1. Assume that you’re going to launch to a 6.4 day orbit and that you’ll then transfer to an 7.6 day orbit, and then a 10 day orbit, and then spend 5 days getting to the Moon (total of 29 days). The cost of transferring to the 5-day lunar transfer from the 6.4 day starting orbit is always the same. 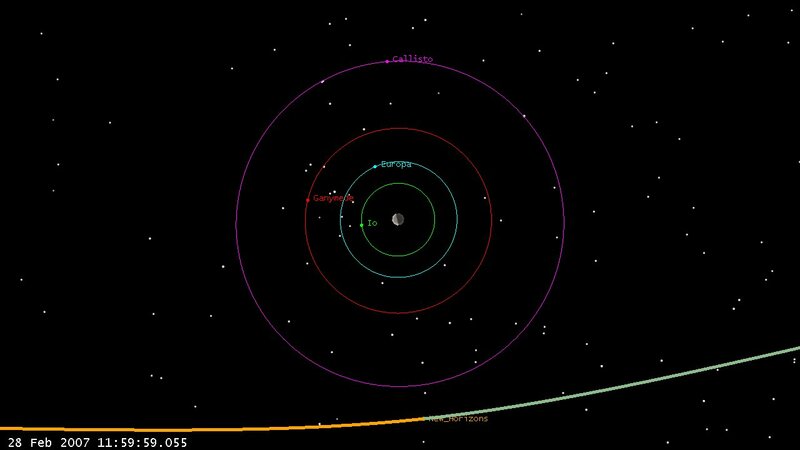 Now say that your rocket doesn’t give you exactly what you want, and instead of a 6.4 day orbit, you are inserted into a 7 day orbit. Instead of doing a TCM to correct out that error, you simply replan your trajectory profile. 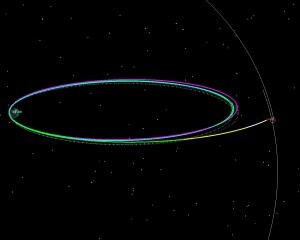 You spend 7 days in the first orbit, but instead of transferring to a 7.6 day orbit, your first maneuver is zero, and you stay in the 7 day orbit for 2 days. 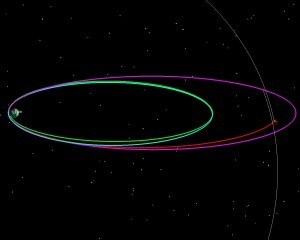 So your first rev is 7 days, second rev is 7 days, and then you transfer to a 10 day orbit, and take 5 more to get to the Moon (still 29). Same thing if you are launched to a 5 day orbit. 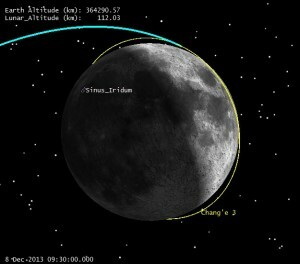 The second orbit can be 9 days, the third 10, and 5 days to the Moon (29 days total again). The total delta-v to get to the Moon doesn’t really change, but your orbit profile is flexible to large dispersions in your injection. 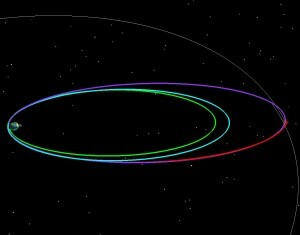 Phasing loops have been used on many other missions (Clementine and WMAP are 2 good examples). 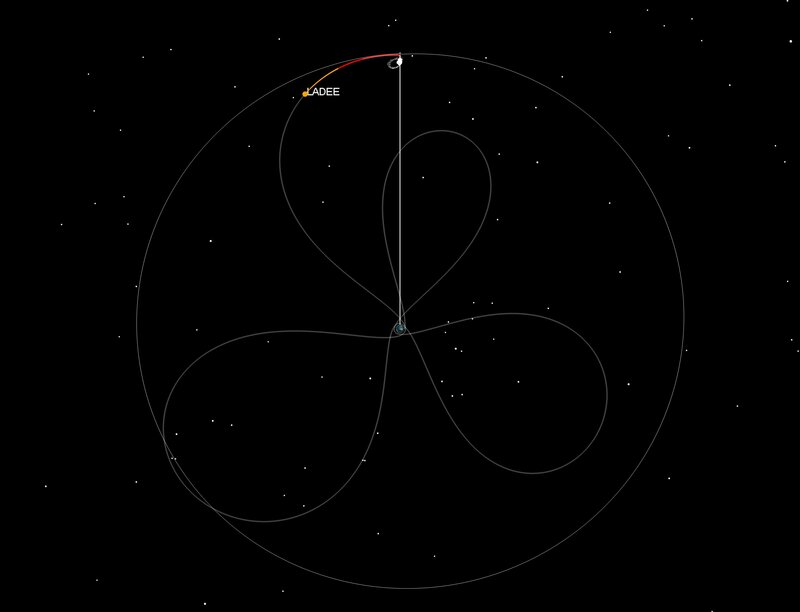 I designed the phasing loops on LADEE to accommodate the Minotaur V dispersions. 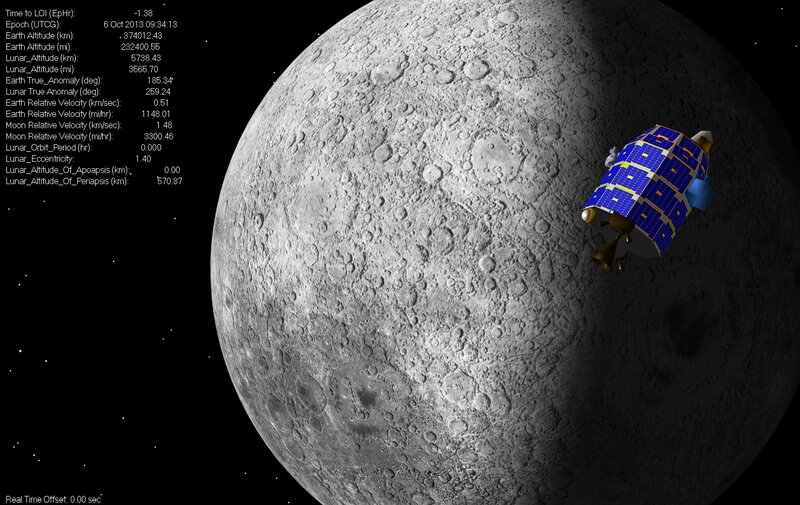 The LADEE spacecraft barely had enough fuel to do its science mission, and the choice of phasing loops allowed the mission to accommodate the Minotaur V dispersions, at the cost of some extra time in cislunar space. The operations costs are not free (of course), but if you can’t fit on the rocket, sometimes you don’t have a mission. 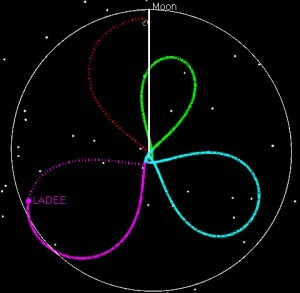 If LADEE had been launched into a 5 day orbit (green), we then could have raised the 2nd orbit to have a 9.5 day period (blue), and the third to have a 9.8 day period purple and then done our normal 5 day transfer to the Moon. The two pictures below tell the story. On the left the orbit is shown in an Earth-Moon Rotating coordinate system. 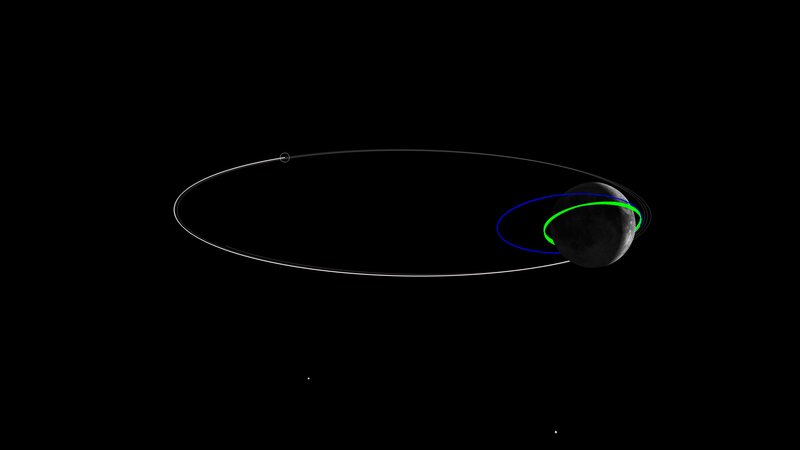 The Earth is in the middle, and the Moon is stationary from the top. 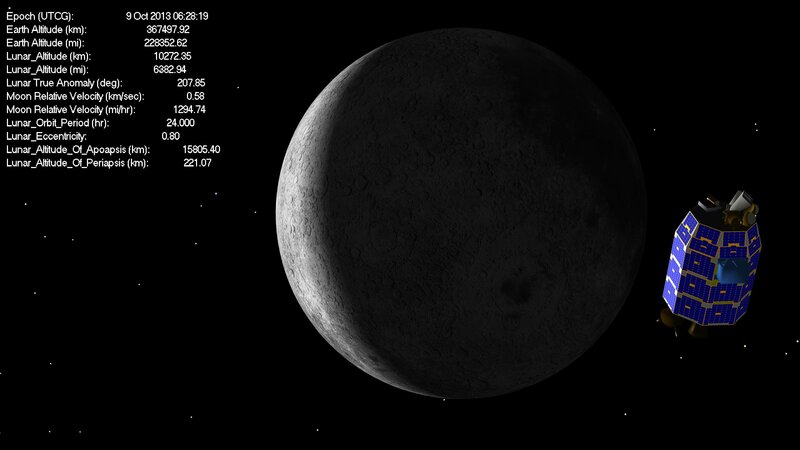 Imagine that you’re way above the Earth-Moon system, and that you are slowly rotating at exactly the same rate as the Moon goes around the Earth. 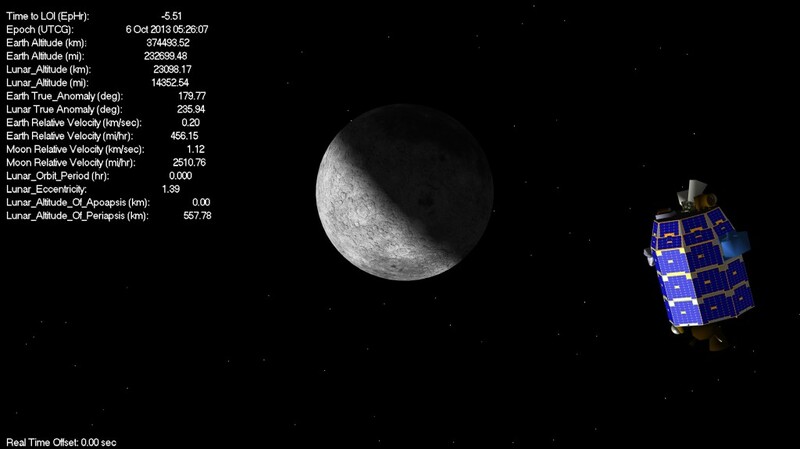 On the right is the normal view, an Earth-centered inertial frame. 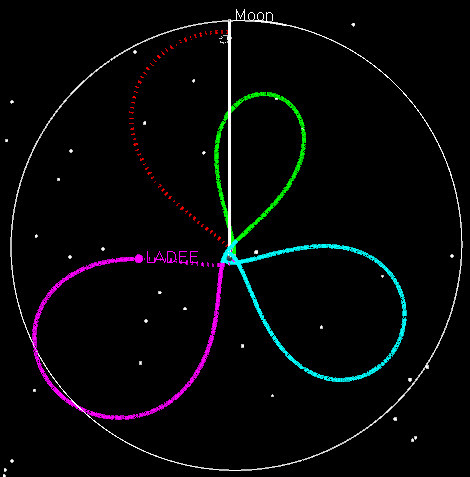 If LADEE had been launched into a 6 day orbit (green), we then could have raised the 2nd orbit to have an 8.3 day period (blue), and the third to have a 9.9 day period purple and then done our normal 5 day transfer to the Moon. 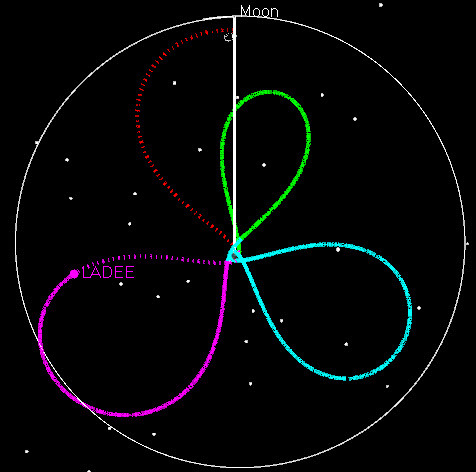 If LADEE had been launched into a 7 day orbit (green), we then could have raised the 2nd orbit to have an 8.1 day period (blue), and the third to have a 9 day period purple and then done our normal 5 day transfer to the Moon. 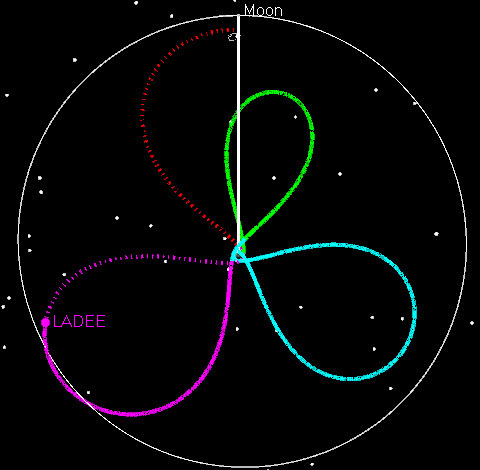 If LADEE had been launched into an 8 day orbit (green), we then could have raised the 2nd orbit to have an 8.4 day period (blue), lowered the third to have a 7.7 day period purple and then done our normal 5 day transfer to the Moon. 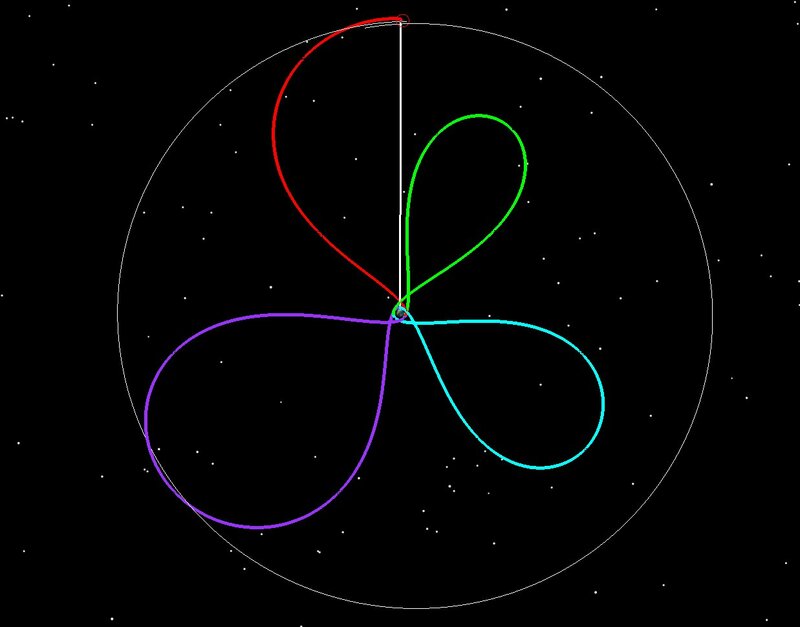 The 8 day orbit and above starts to cost more energy, because you have to lower the 2nd orbit and then raise it back up for the third. So in this case, while the rocket would have placed us in a higher orbit than we wanted (and thus you’d think it might save us energy) we end up having to pay a bit extra to get the timing right. 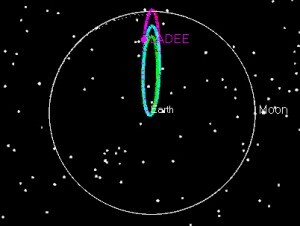 Note here that all the examples I show have us keeping the time of the third perigee mostly constant, along with the time of flight between that perigee and the Moon constant at 5 days. 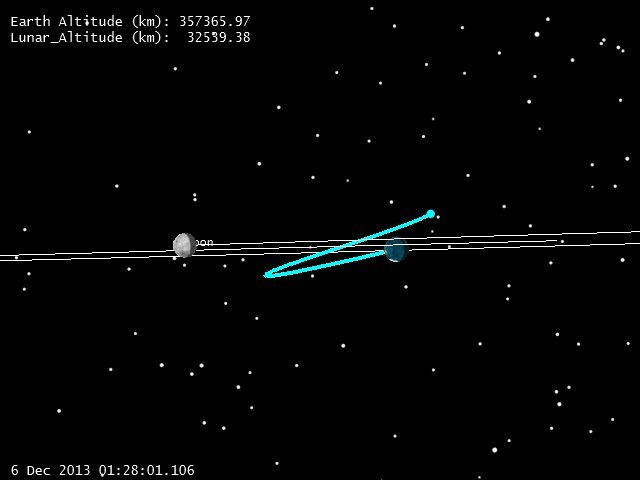 This comes from the fact that once we’ve launched and the Minotaur Stage 5 has fired, our line of apsides (between apogee and perigee) is mostly fixed in space (actually it was fixed before launch for optimization purposes, but that’s another topic) and we are now locked into getting at the Moon when the Moon is at the same latitude as our apogee. Another thing phasing loops give you are a wider launch window. With the argument of perigee (and thus the line of apsides) fixed before launch, we are fixed to arrive at the Moon when it as a specific latitude (same as our apogee). 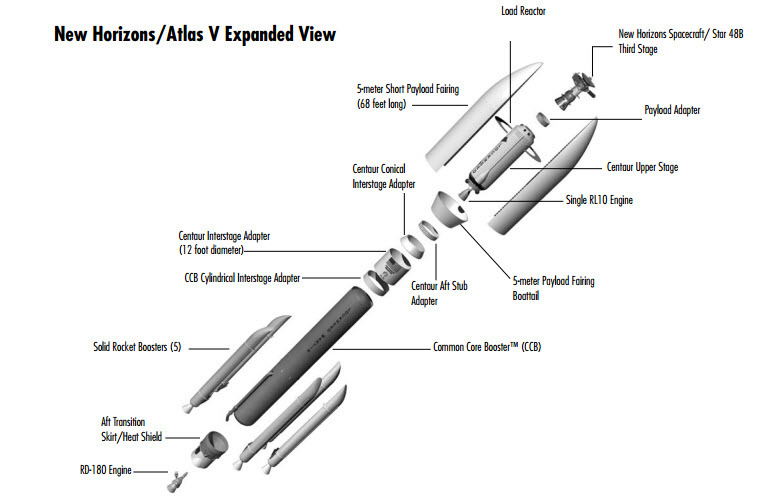 Given that, a direct launch would have only had a very short launch period if you assume that you’re always launching with the same energy from the upper stage. Phasing loops allow you to widen the window up to 5 days. 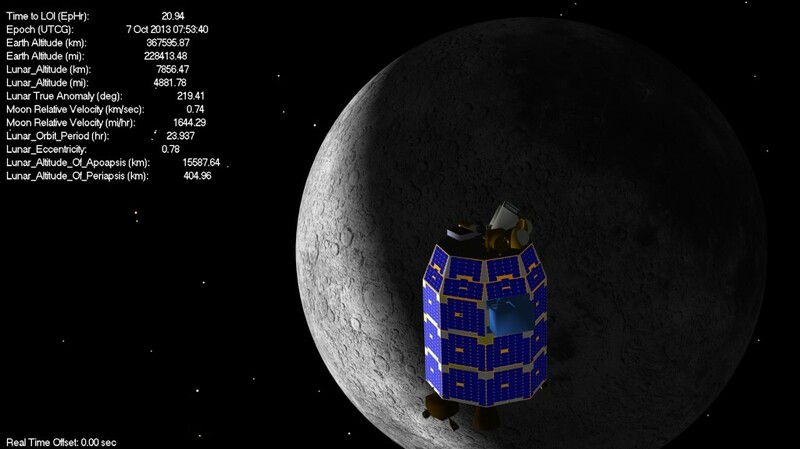 In the case of LADEE, we actually launched on the first day of the launch period (on the first second of the launch window) but we were lucky. We’ll take the luck, but we didn’t plan for it. Instead, we had a 5 day window. 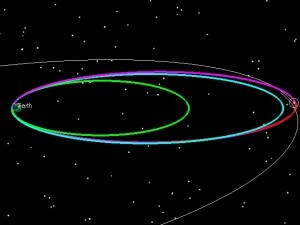 On the first day of the launch window (Sep. 6, 2013), our first orbit would be 6.4 days, the 2nd 7.95, the third 9.95 and then about 5 days to the Moon. On the second day of the launch window (Sep. 7, 2013), our first orbit would be 6.33 days [Note: the rocket is always launching us to the same orbit, but the Moon’s gravity alters our orbit a bit, so the first rev doesn’t always have the same period] , the 2nd 7.00, the third 9.95 and then about 5 days to the Moon. 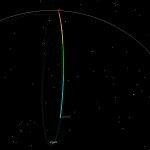 On the third day of the launch window (Sep. 8, 2013), our first orbit would be 6.24 days, the 2nd 6.32, the third 9.55 and then about 5 days to the Moon. On the fourth day of the launch window (Sep. 9, 2013), our first orbit would be 6.19 days, the 2nd 6.27, the third 8.82 and then about 5 days to the Moon. 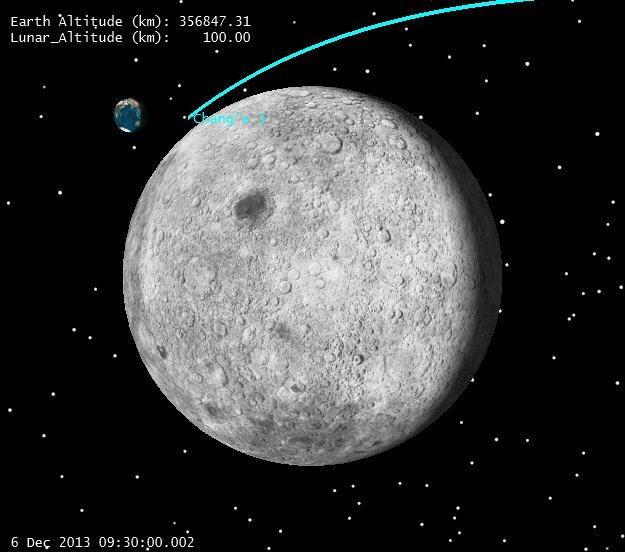 The last day of the launch window (Sep. 10, 2013), our first orbit would be 6.16 days, the 2nd 6.32, the third 7.95 and then about 5 days to the Moon. Why does the launch period stop? Look at the rotating frame picture in each of the examples. Think of the picture in terms of quadrants, with the first quadrant being in the upper right, second in the lower right, third in the lower left, and 4th in the upper left. Any loop in the first quadrant gets to apogee with the Moon in front of it. 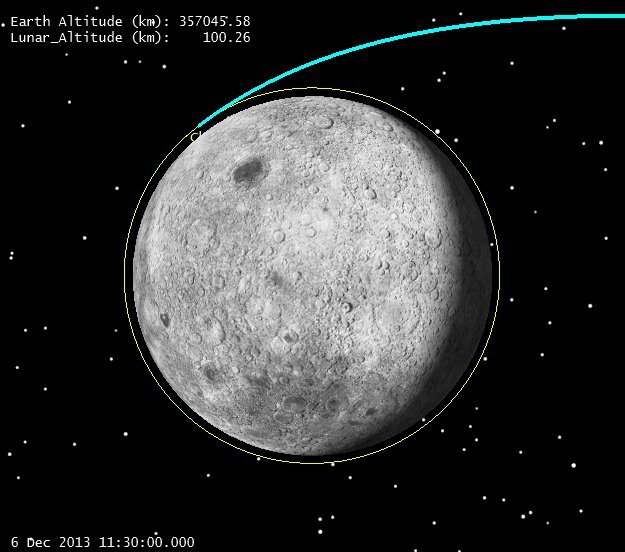 This is fine, because the gravity of the Moon will give us some extra velocity at apogee, and will raise our subsequent perigee altitude. 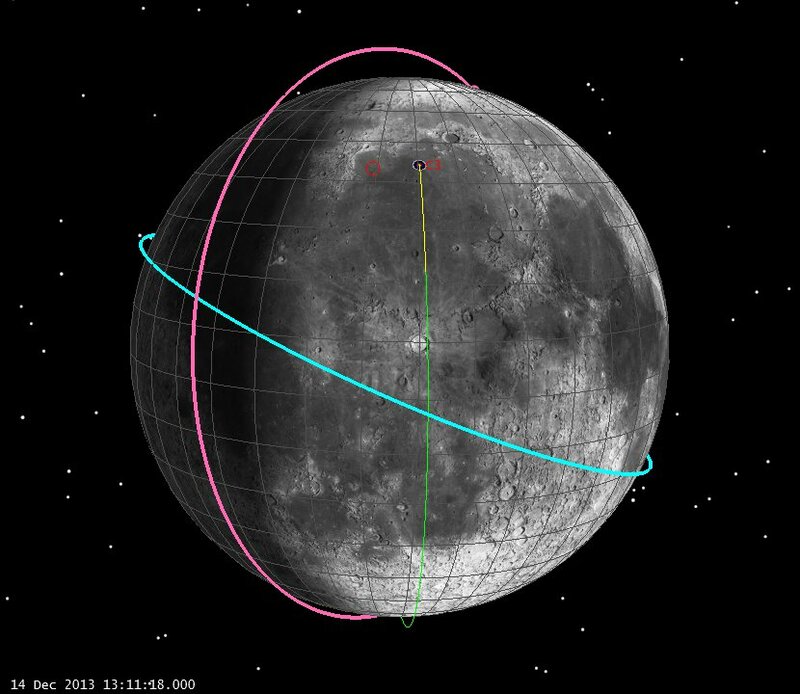 The closer we are to the Earth-Moon line (the vertical white line in the rotating frame picture), the more boost we get from the Moon. 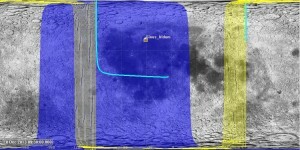 The further away we are from the Moon, the less boost we get. 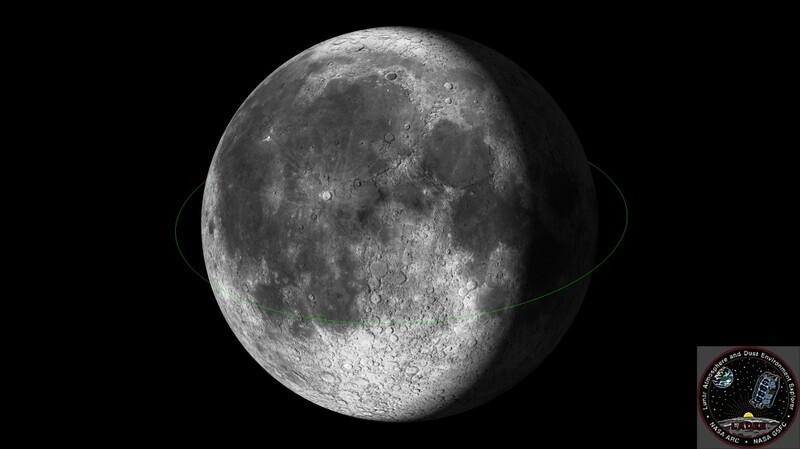 Going into the 4th quadrant is bad, because if we get in front of the Moon at apogee, then the Moon’s gravity slows us down, and drives the perigee altitude into the Earth. 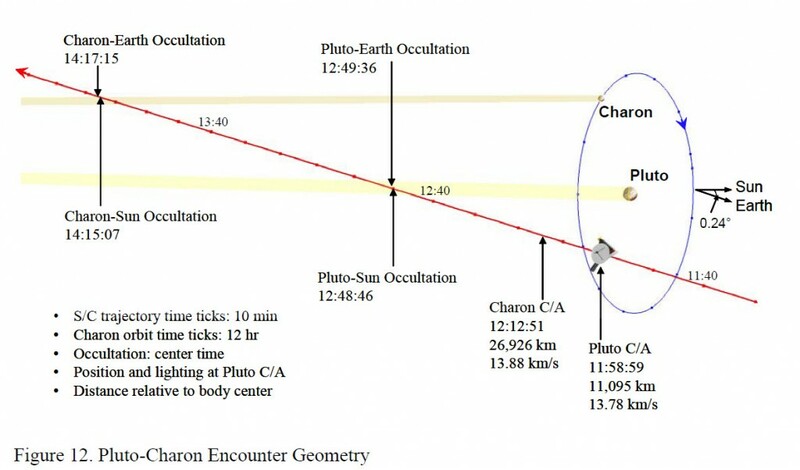 In the 2nd quadrant we get slight gravitational lowering at perigee, and the 3rd we get slight gravitational raising. 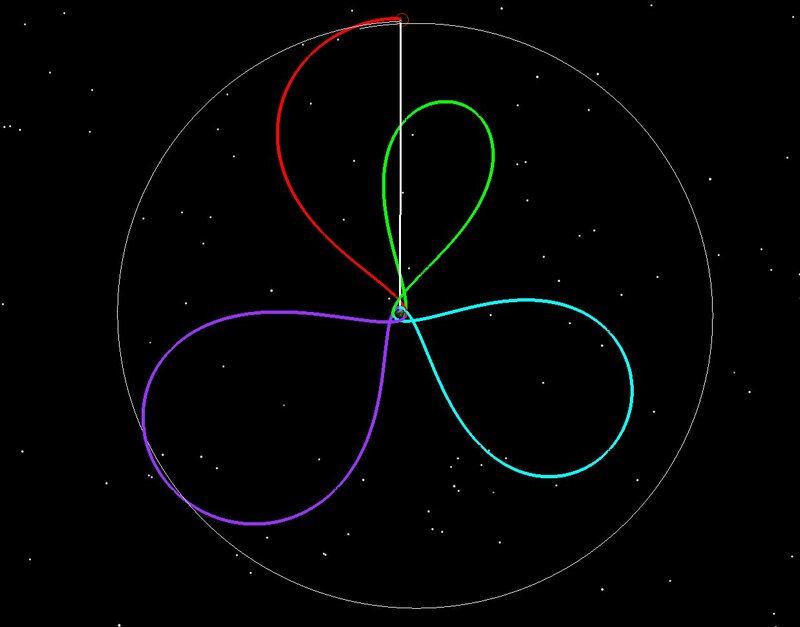 If you watch the sequence through the launch period, you see that each day the first loop clocks further (clockwise) to the right, closer to the 2nd quadrant. 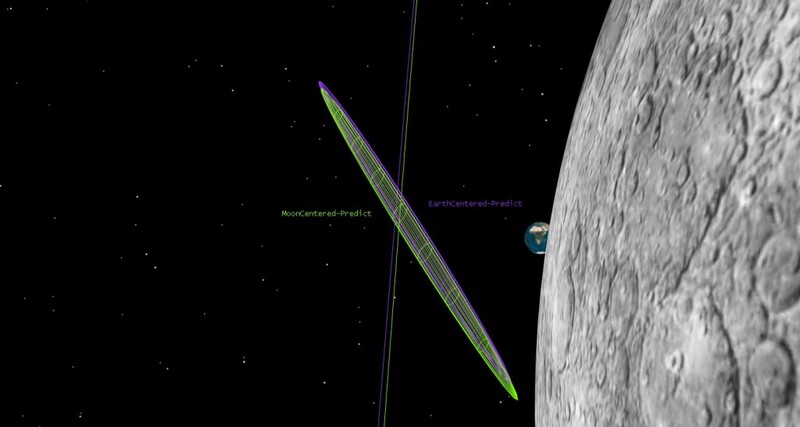 We have to launch to get our orbital plane to match the Moon’s on arrival, and also have to make this happen when the Moon has the same latitude as our apogee. 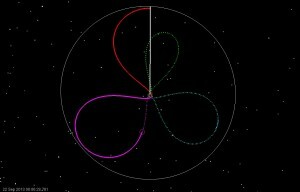 The phasing loop plan is also very robust in the face of missed maneuvers. A missed PM1, for example, can easily be accommodated by modified PM2 and PM3 maneuvers and still get to the Moon at the same time. A missed PM2 is can be accommodated by waiting another month in orbit, and achieving LOI-1 in November. 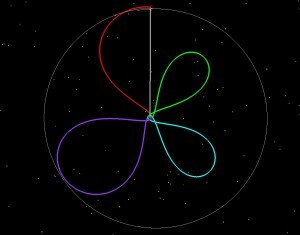 The ability of the plan to easily be modified in the face of contingencies is another strong feature of the phasing orbit approach. In the pictures below, we see what happens with a missed PM1. 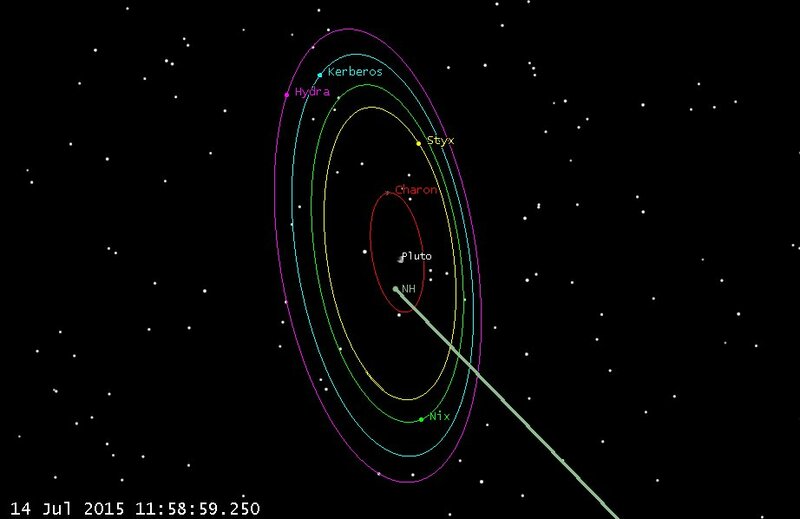 The spacecraft stays in 6.4 day orbit for a second rev, and then raises to a 11.25 day orbit with a 41 m/sec maneuver. 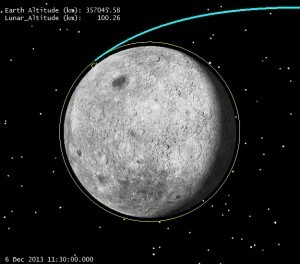 At the final perigee (Pf or PM3) we execute a -8 m/sec maneuver to bring apogee down to Lunar altitude. The plan is also robust to a missed PM2 maneuver. 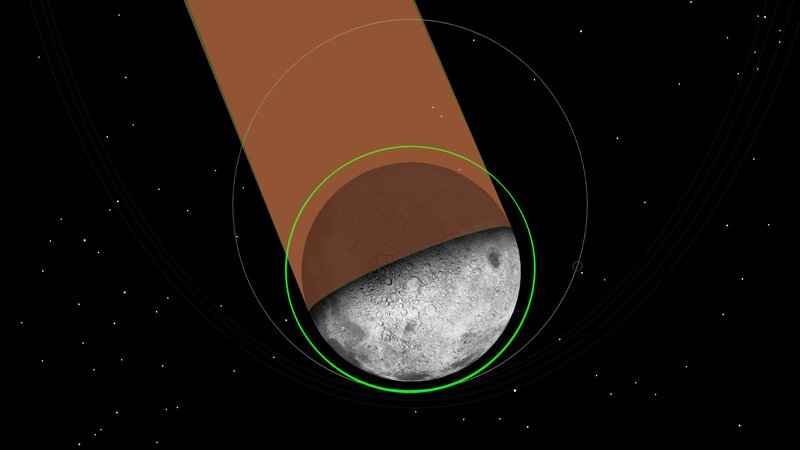 This profile would require LADEE to wait an extra month in Earth orbit. The gray orbits indicate the first month. We show the trajectory starting after PM1 moving towards PM2. Once PM2 is missed, the spacecraft spends 2 more revs in the grey (moving through the 4th quadrant) and then the approach pattern starts again. 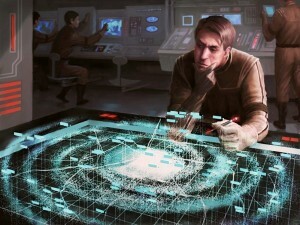 Phasing loops offer several advantages to the mission planner. At the expense of longer operation costs, phasing loops have offer a reduced TCM budget in the face of large launch dispersions, expanded launch windows, and over-all robustness to contingencies.